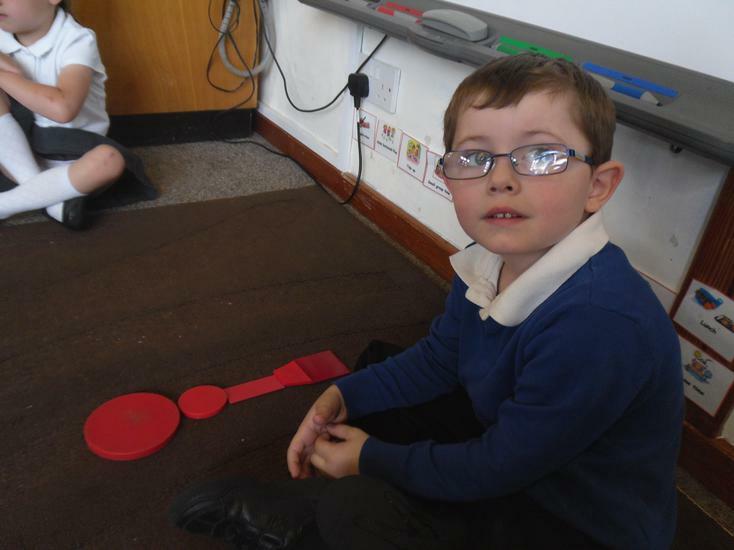 The Key people have been working hard to settle all of the children. 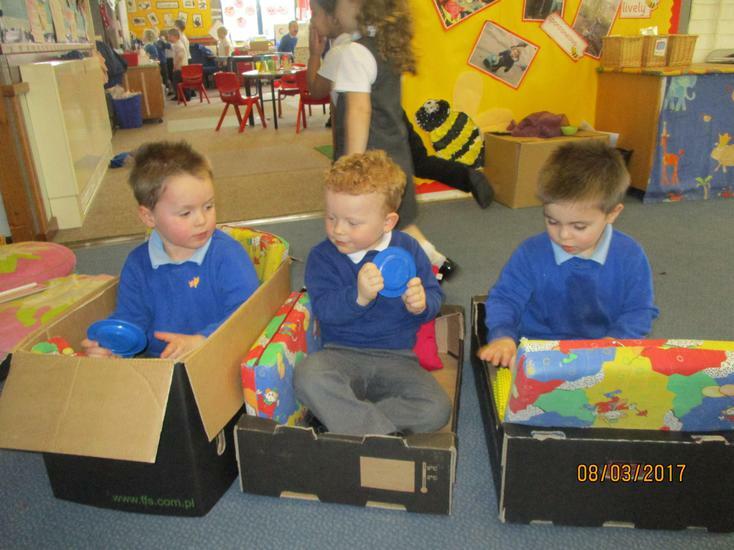 They have found out the children's favourite colours, favourite toys and favourite snacks. 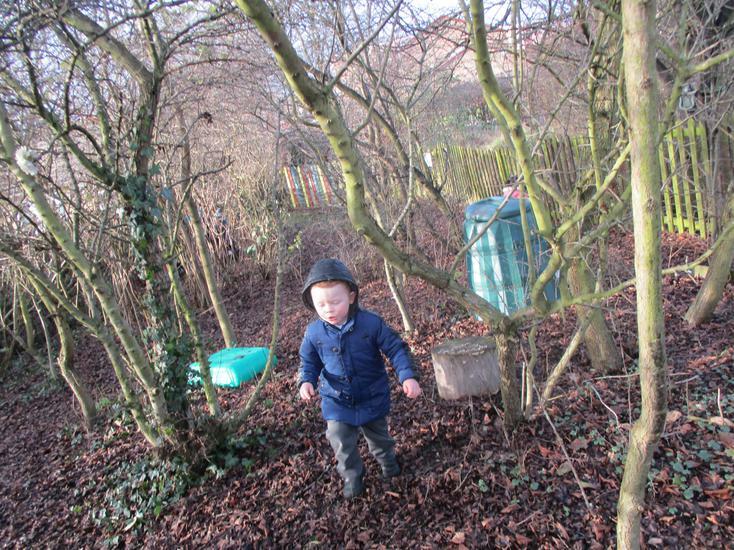 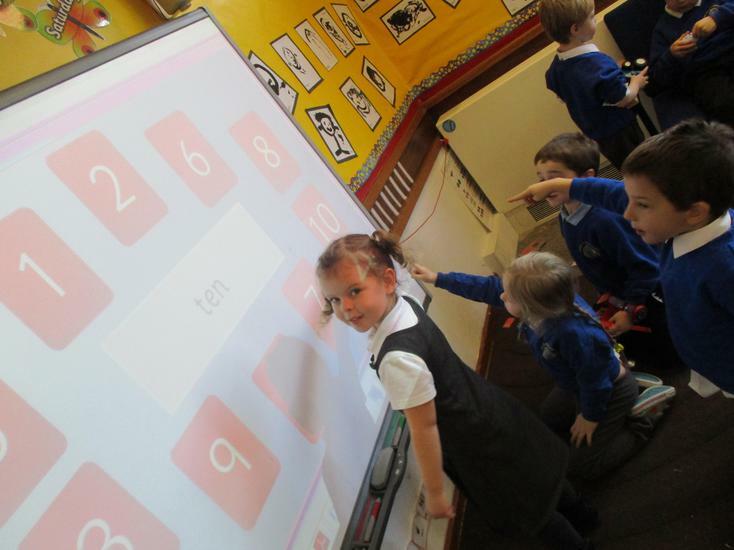 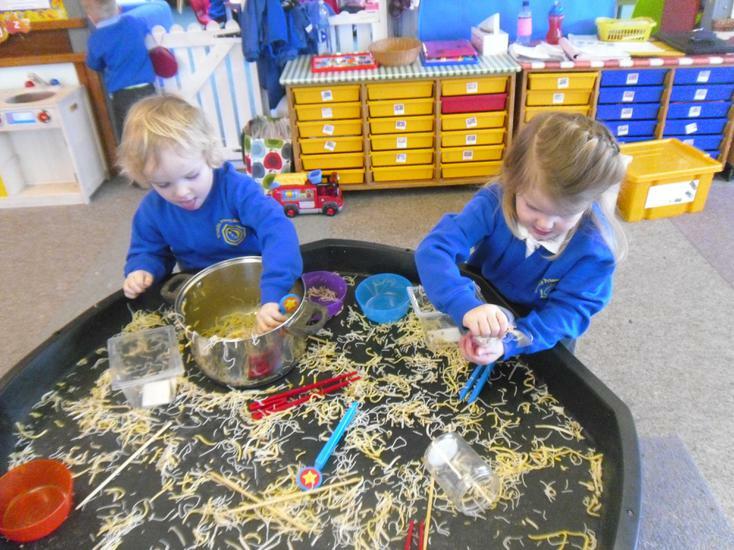 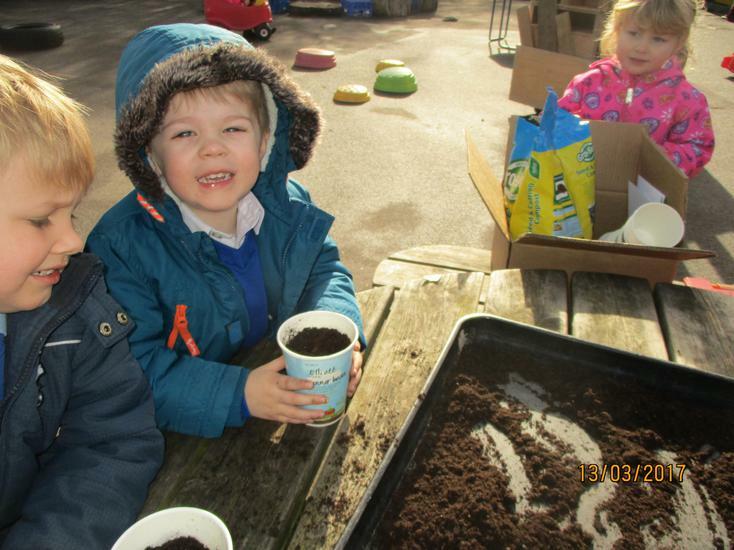 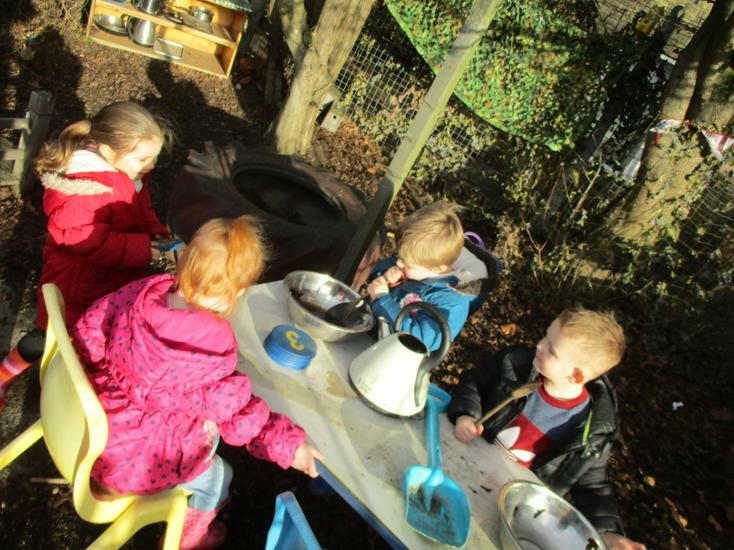 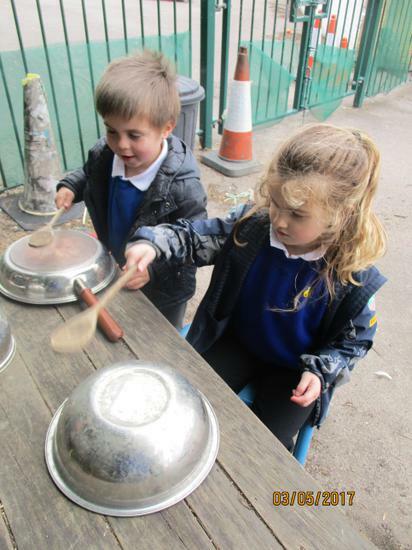 The nursery is full of creative and critical thinkers bursting with enthusiasm and curiosity! 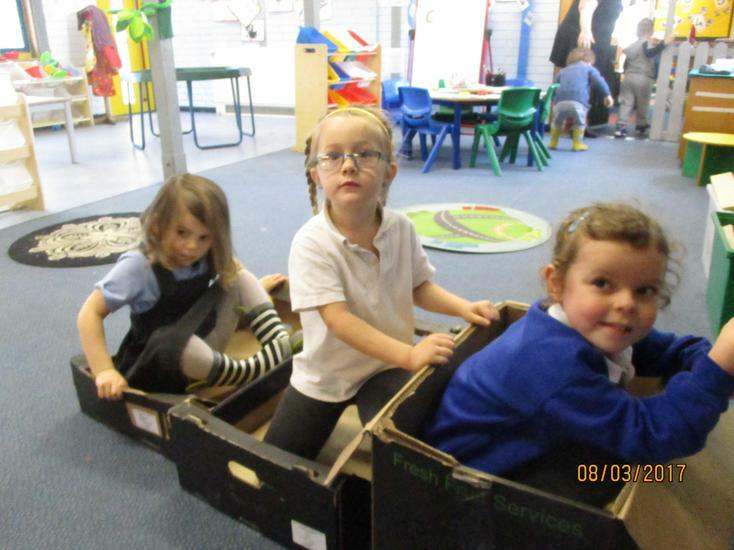 This term our theme is journeys. 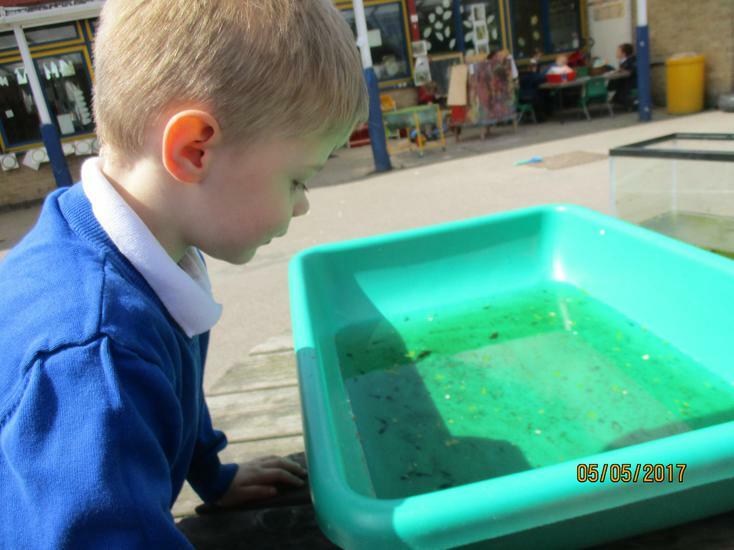 We have started the term looking at the journey made by the caterpillar to turn into a butterfly and the tadpole into a frog. 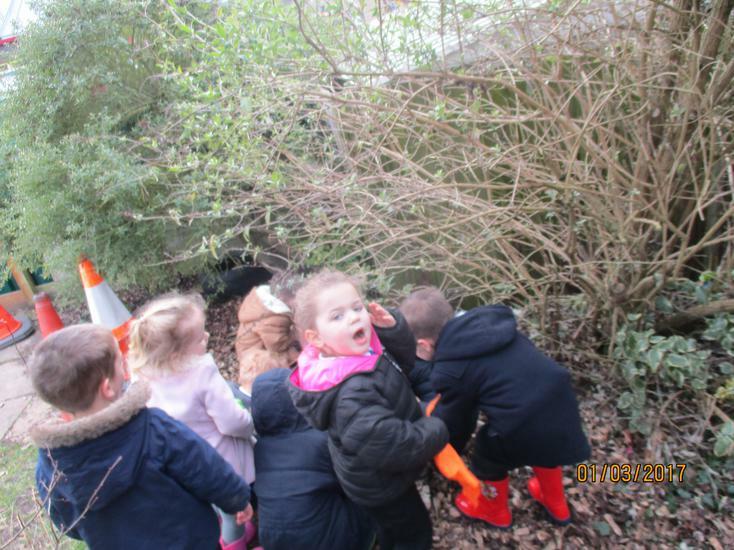 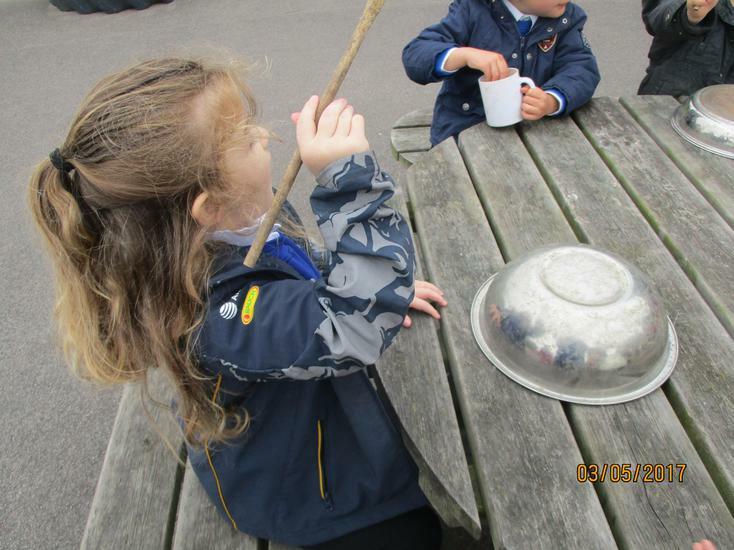 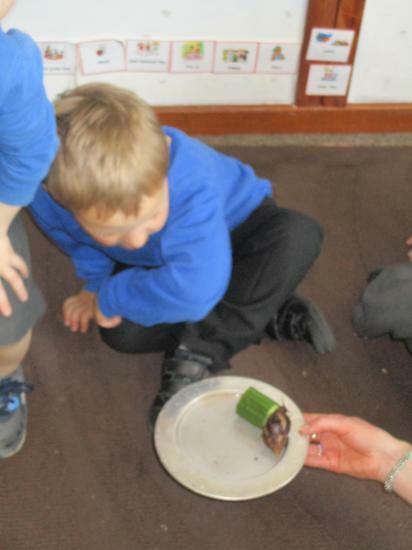 The children have taken plenty of trips to the pond and have found all sorts of creatures. 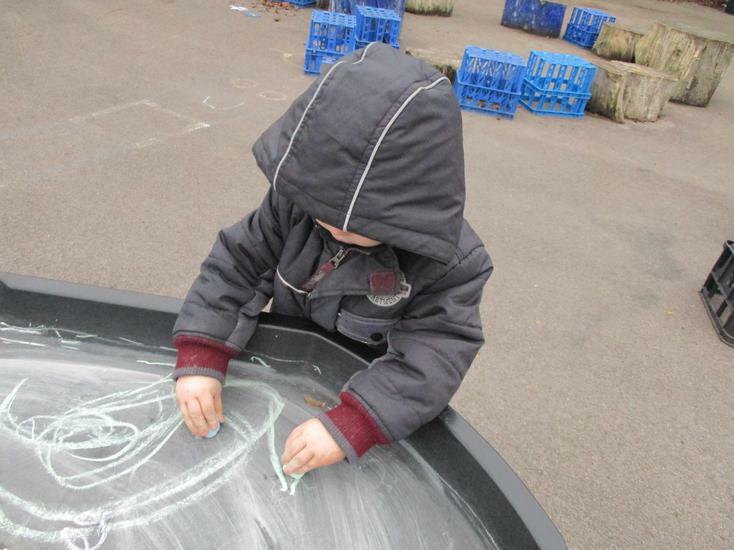 They are taking good care of their new friends and have enjoyed drawing them at different stages of their journey. 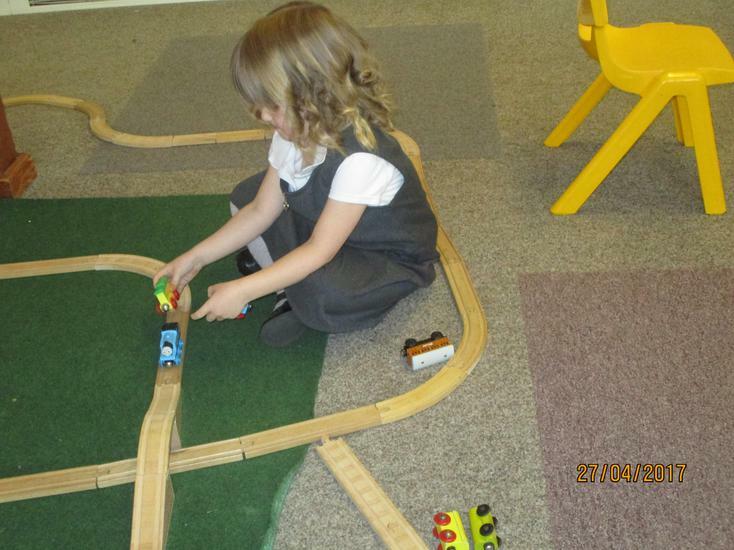 Later in the term we will be exploring the different ways of travelling. 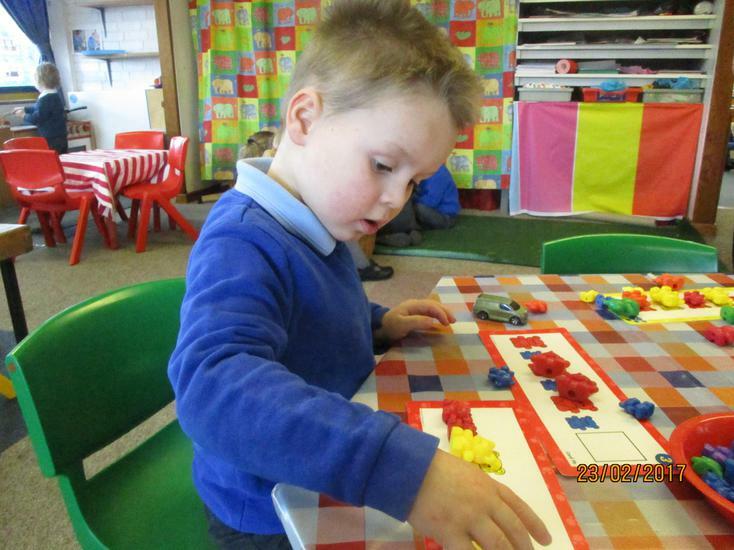 We will be making planes, buses, boats and trains. 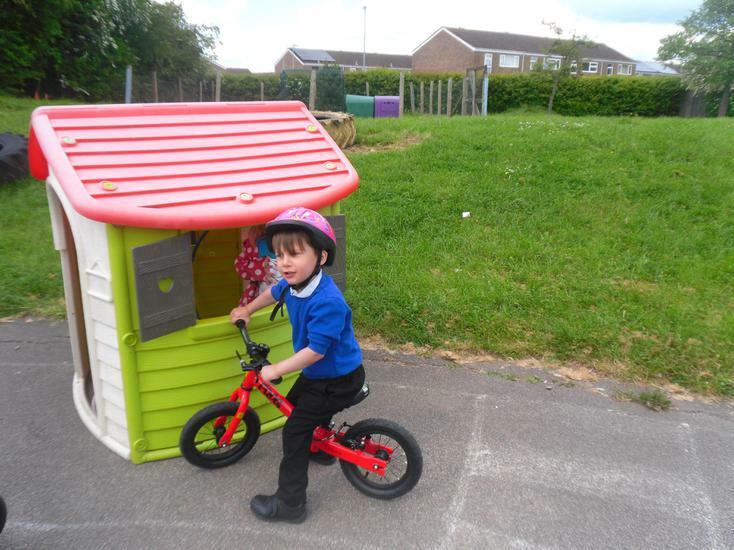 We have started the term with the topic of 'Homes'. 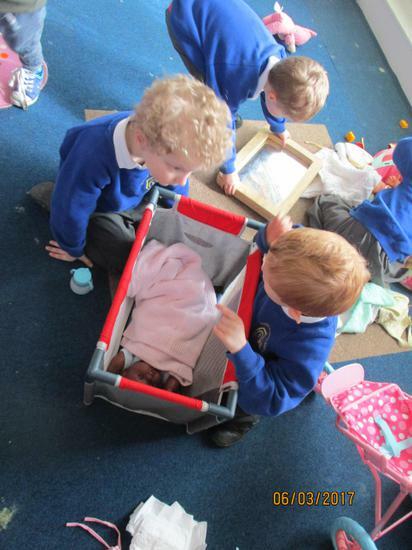 Within this topic we will be talking about our own homes and families; we will be making observations, identifying similarities and differences. 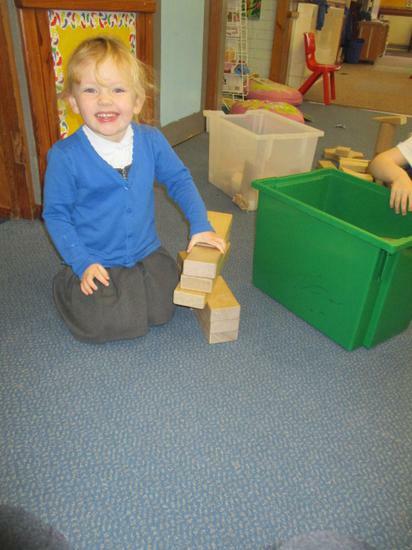 We will investigate building materials and our wide range of construction tools at Nursery. 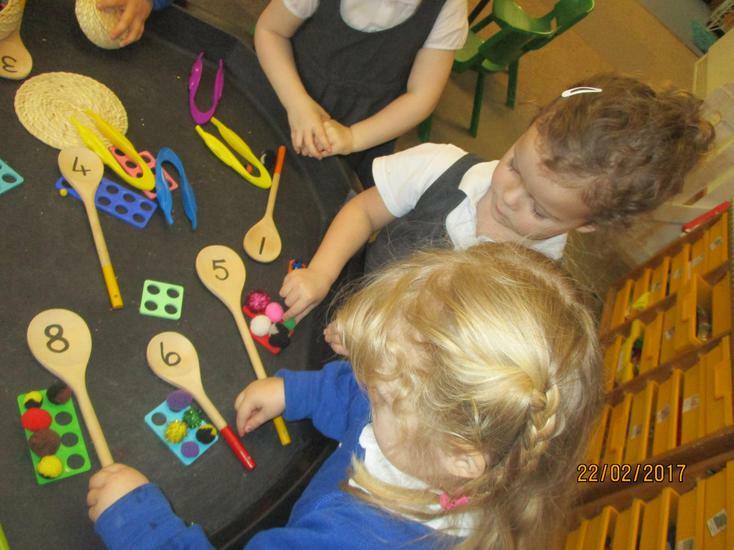 We will be learning how to identify numbers the numbers and develop our counting skills. 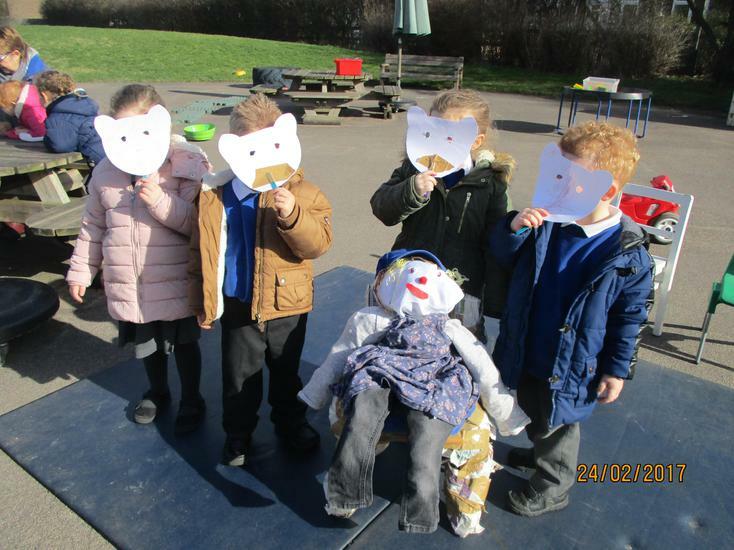 This half term we will share the story of 'The Three Little Pigs', retelling the story using puppets and dressing up clothes. 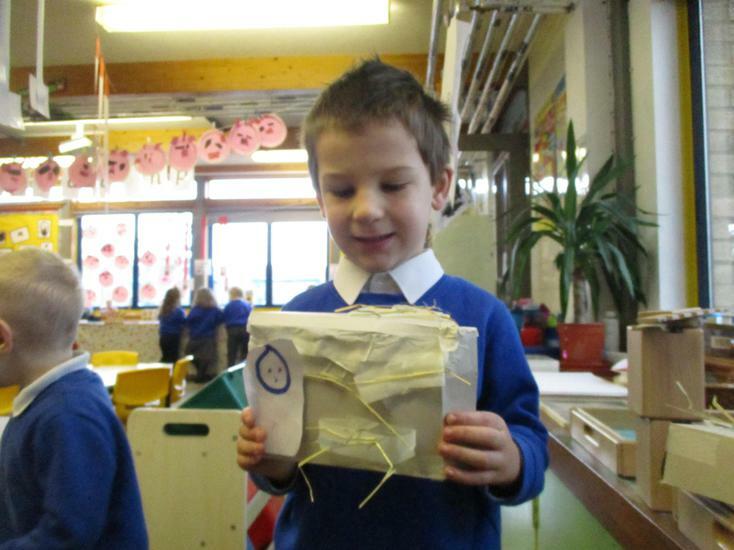 We will also make our own stick and straw houses to 'huff and puff and blow down'. 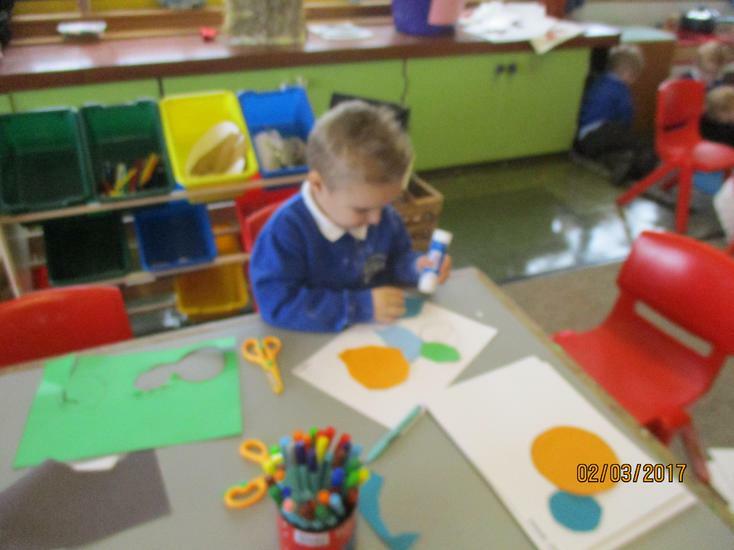 We have continued our topic of 'Homes' and learnt about the three bears and Jack and the beanstalk. 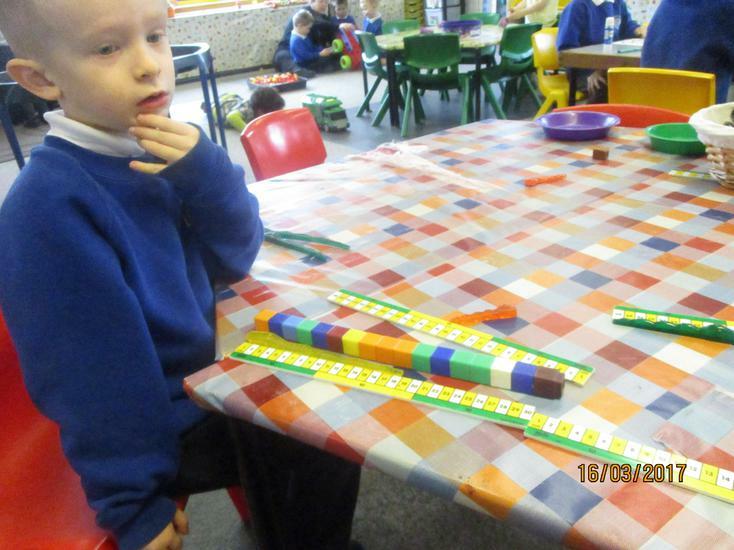 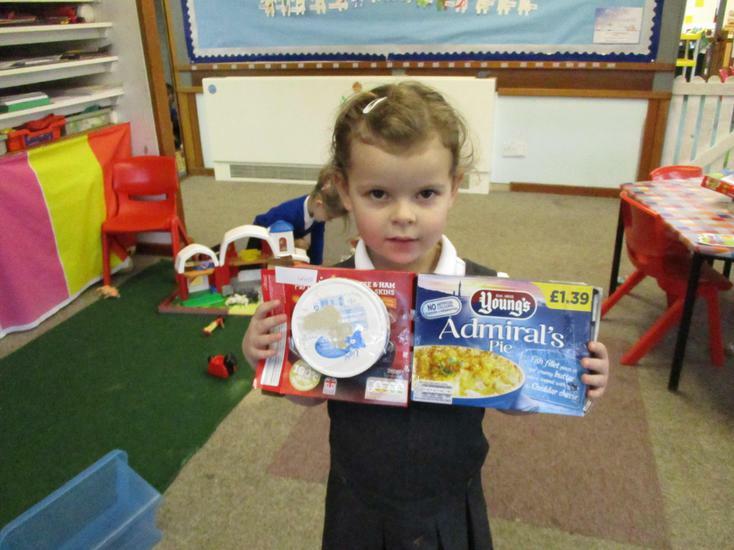 We have got really good at measuring this term and can order objects by length and height. 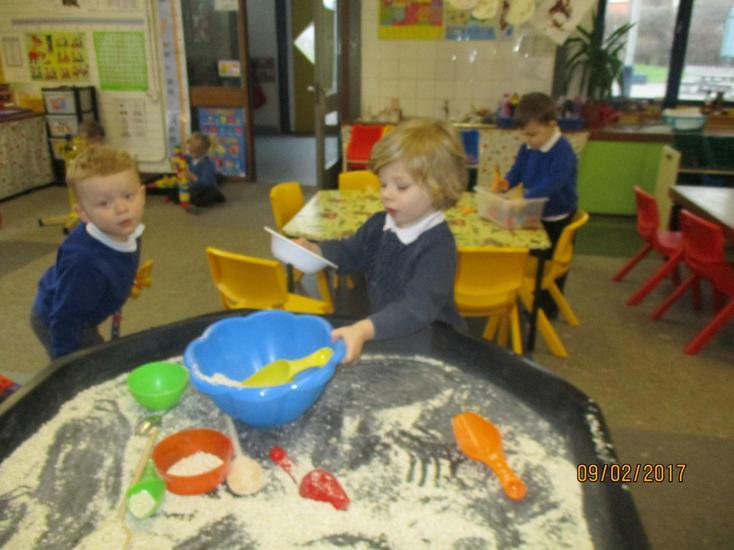 We can retell the fairy tales in great detail and have enjoyed acting the stories out using the play house and fabulous imaginations. 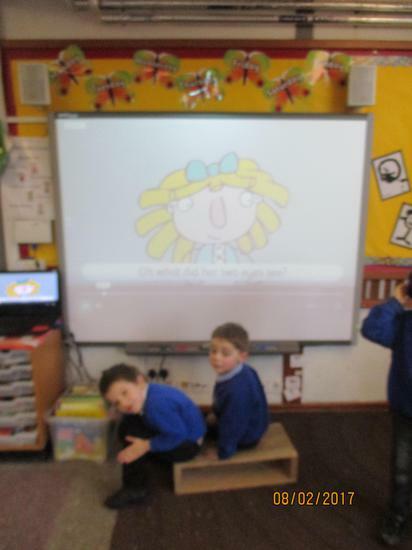 We have talked about the ways Goldilocks and Jack have behaved and given them some advice. 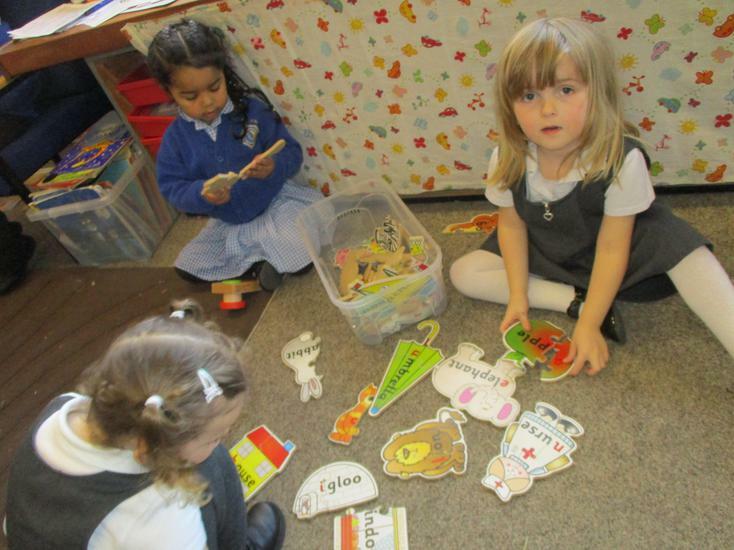 The children have been busy talking about they families and pets. 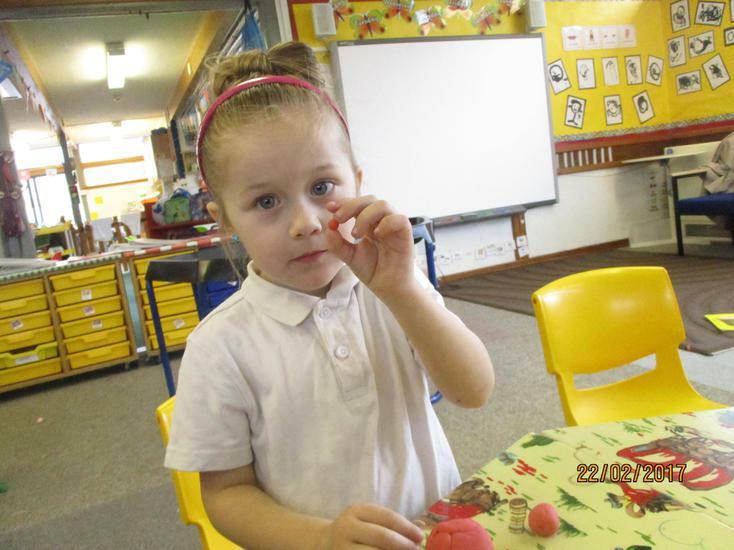 They have been using the stickle people to help them to include everybody who lives in their home. 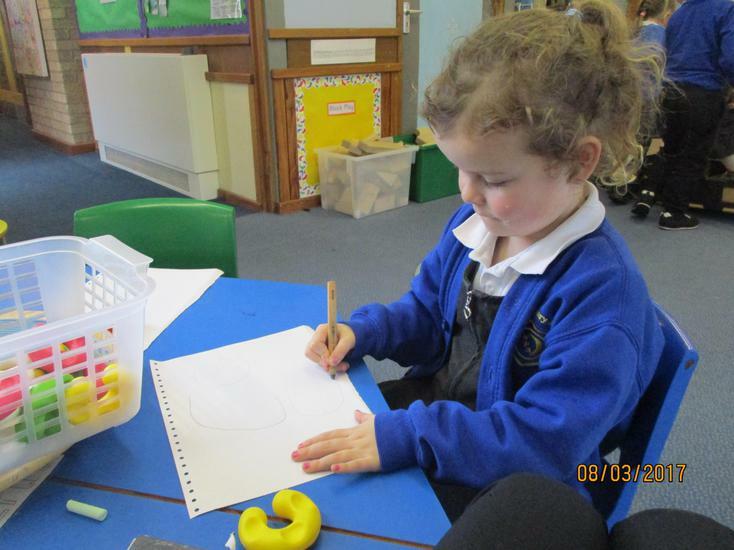 The older Nursery children have also had a go at drawing who lives at home with them and these have been put in their Learning Journey Folders. 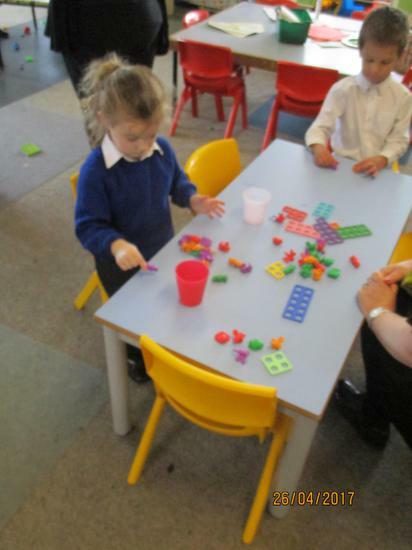 The children have enjoyed talking about there different families and what they enjoy doing together. 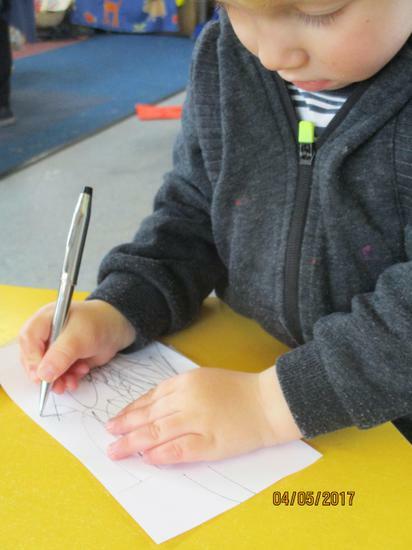 If you have any photographs of your child with their family we would love to see them and add them into they Learning Journey Folder. 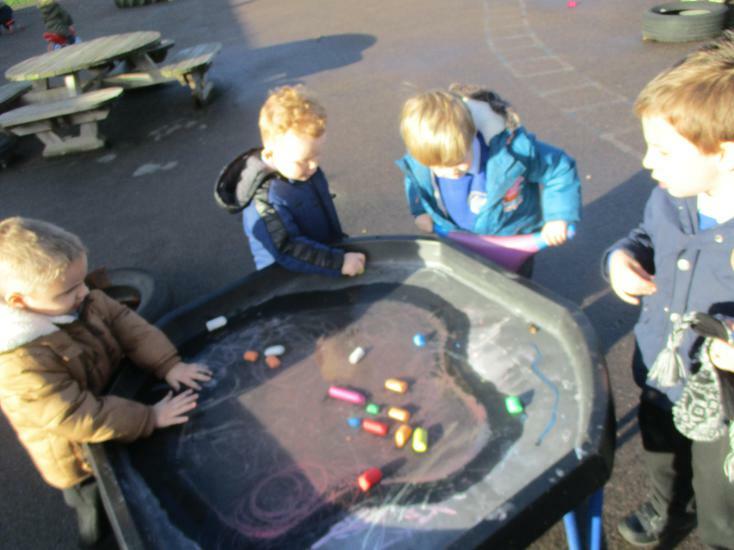 The children have been talking about fireworks including their colours and sounds. 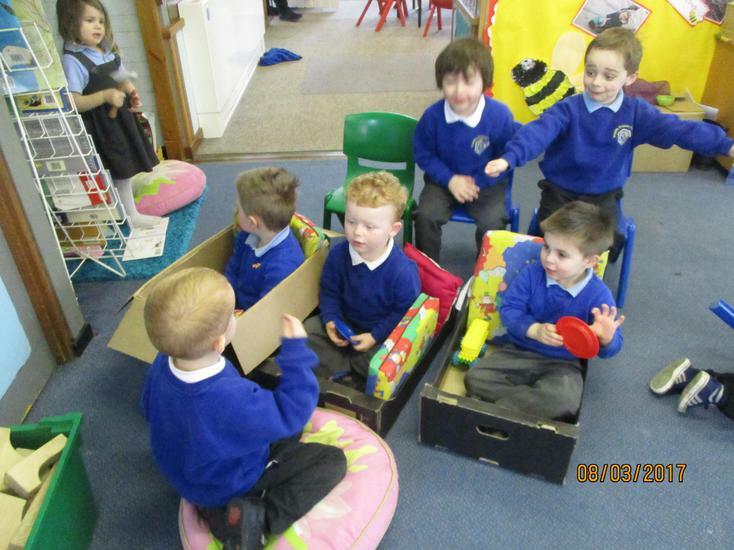 They have learnt a new firework song to the tune of 'Wheels on the Bus' which they love singing. 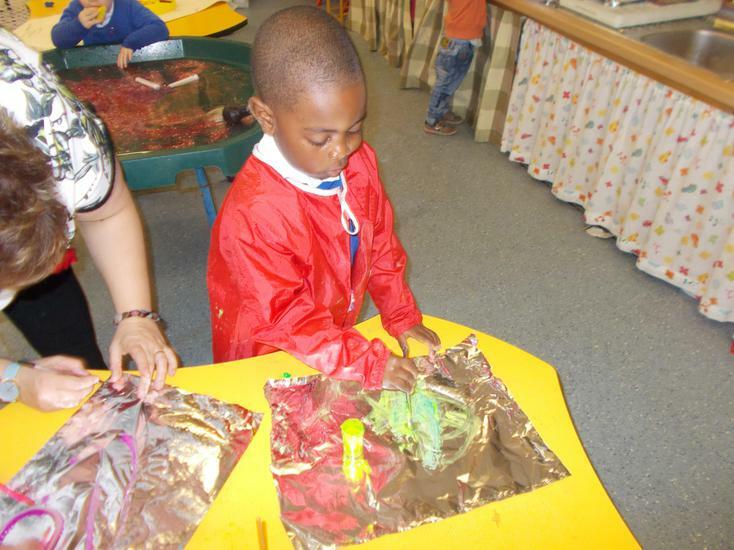 Also the children have created some fantastic firework pictures using paint, glitter and kitchen roll. 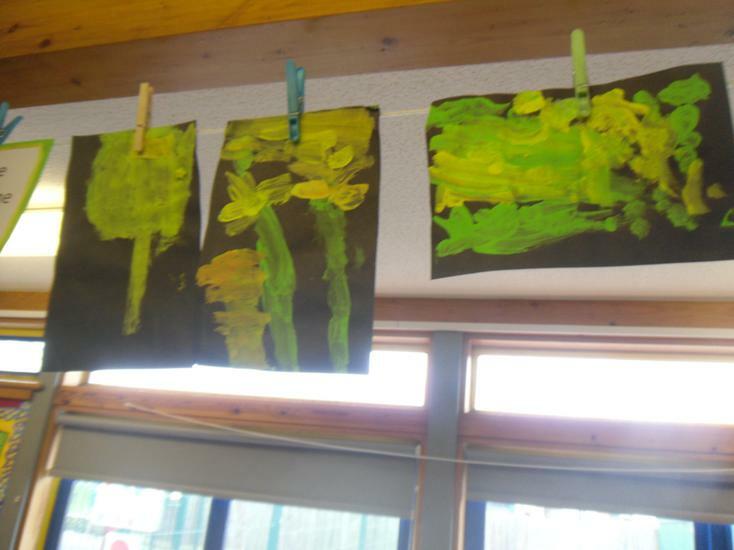 Please come and have a look at the display of the children's creative art work. 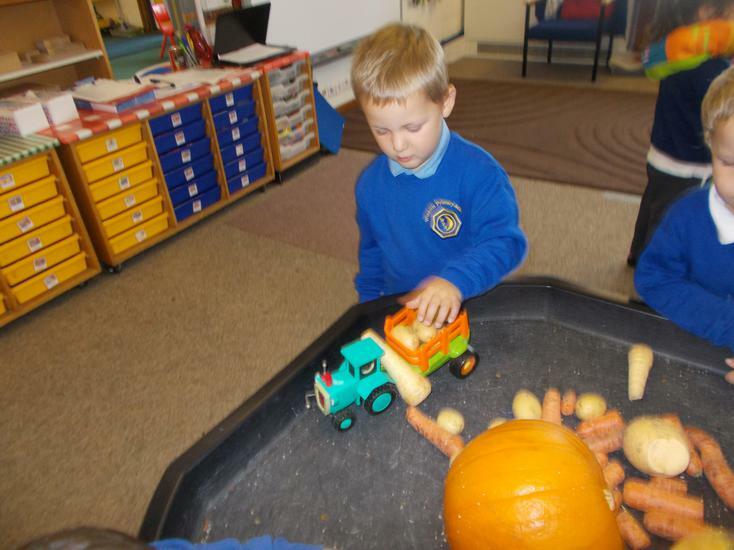 The children have been busy exploring the season of Autumn. 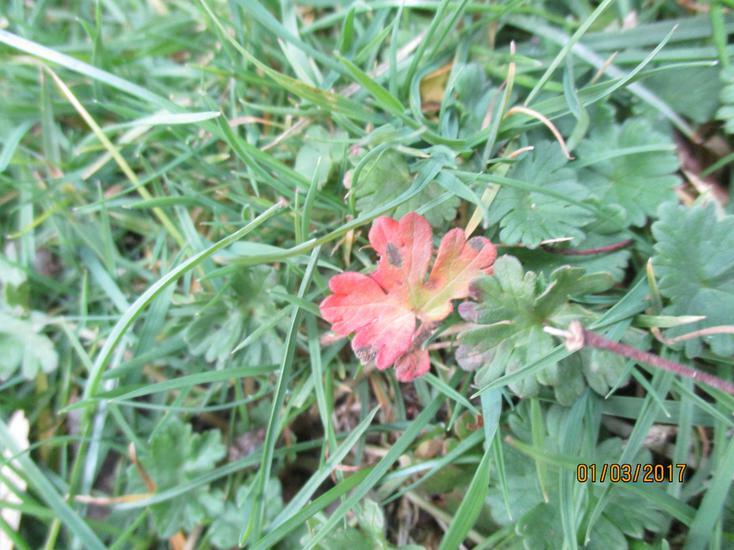 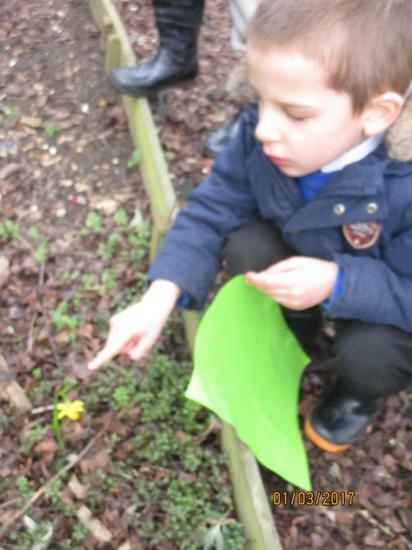 We have been outside finding different coloured and shaped leaves. 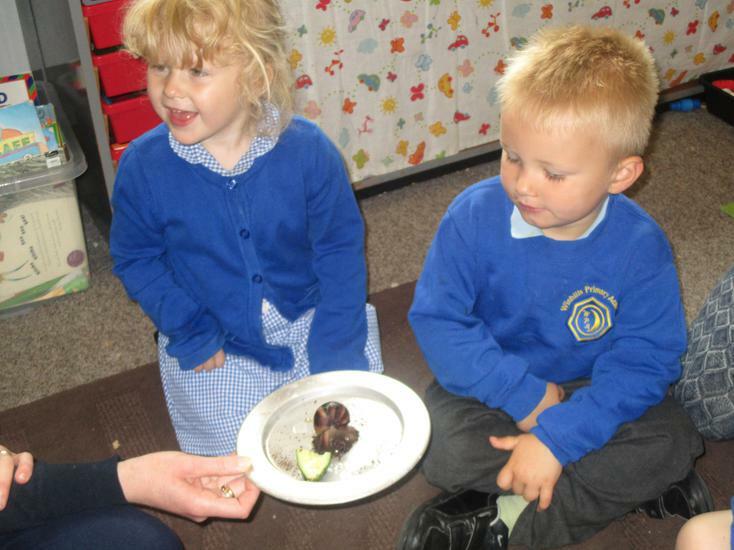 We have been looking at the berries on the bushes, apples and seeds on the trees around school. 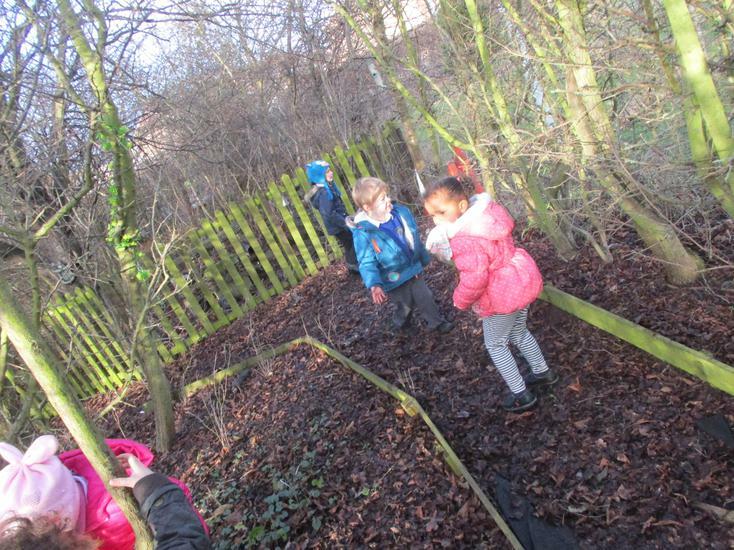 The children have been reminded about not picking any of the berries and to leave them for the birds to eat when it gets colder. 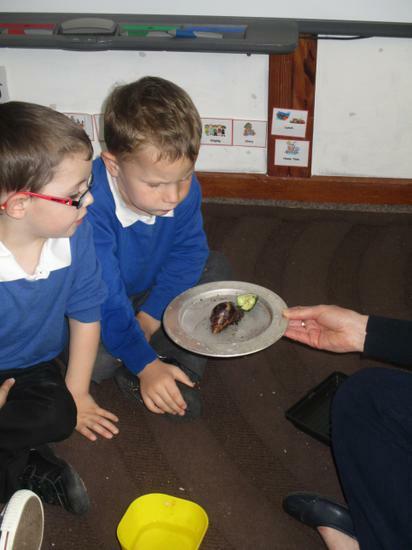 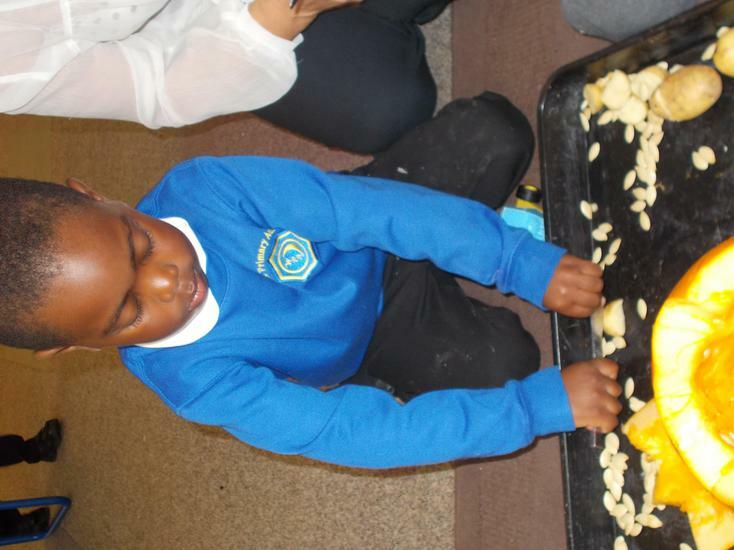 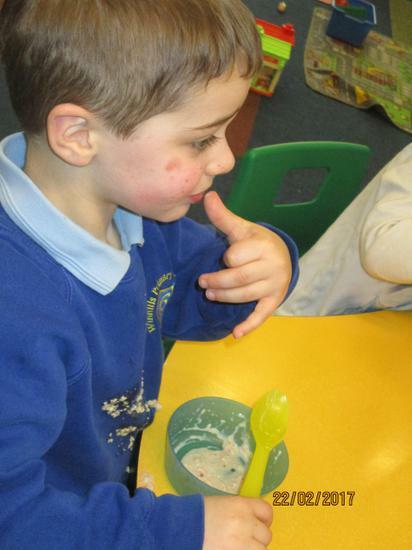 The children have used the magnifying glasses to look at the skin of different varieties of apples and pears. 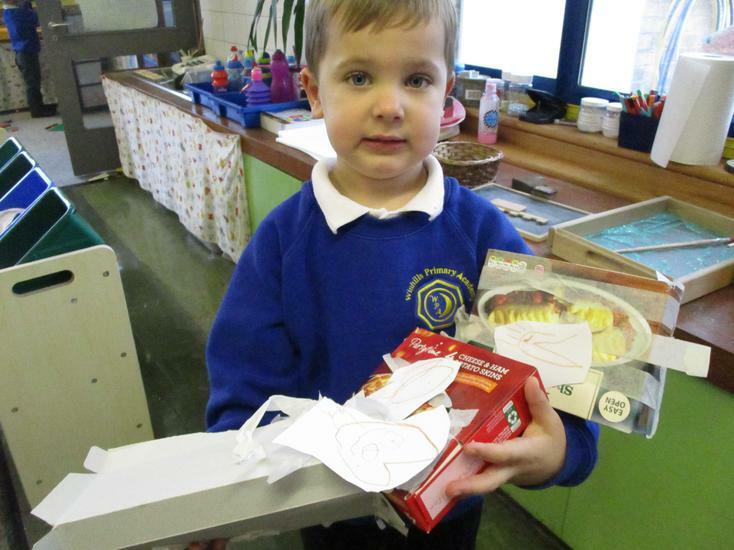 We then used the knives to cut them open to look at the pips inside. 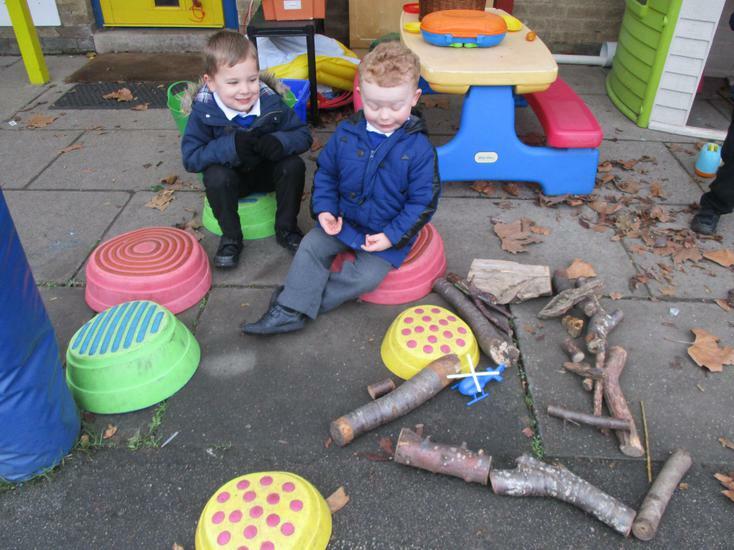 Please encourage your child to find a leaf or seeds or nut that has fallen off a tree and bring it nursery so we can continue learning about Autumn. 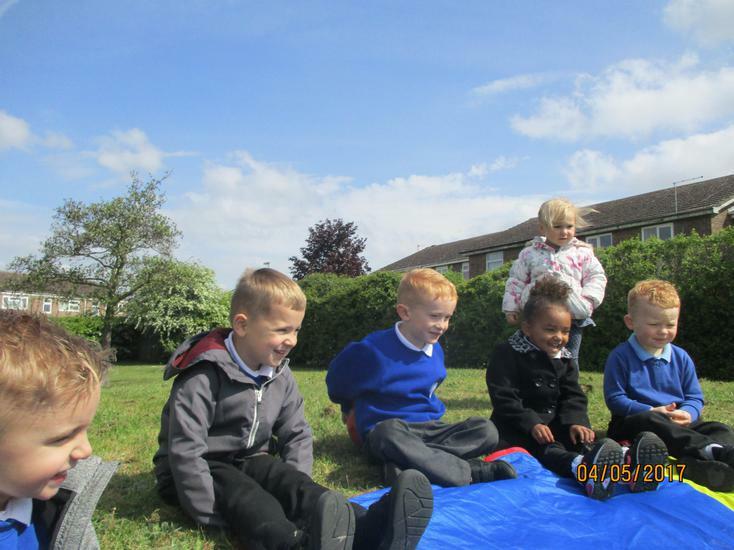 Week beginning 23/05/16. 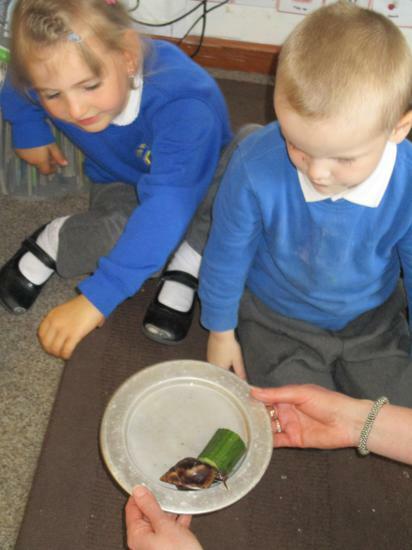 The Children all gathered to 'catch up' with Geoff the African land snail. 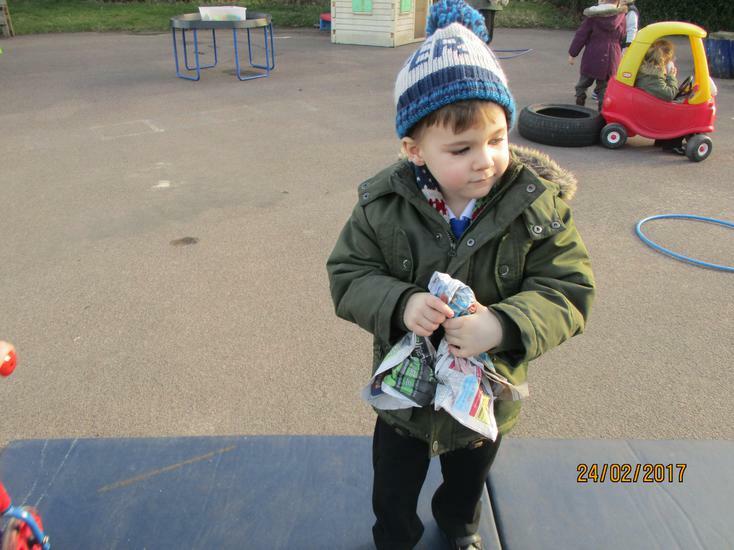 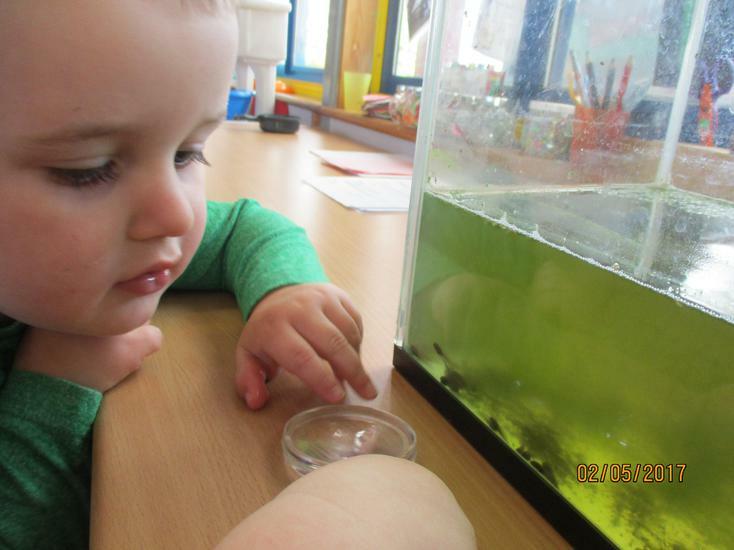 Mrs Wiseman bought him in to nursery so the children could see the changes. 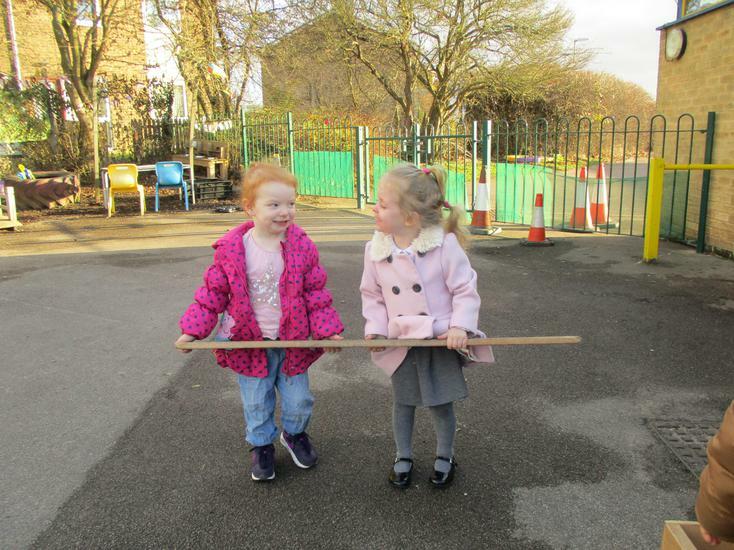 "He is Ginourmous!" 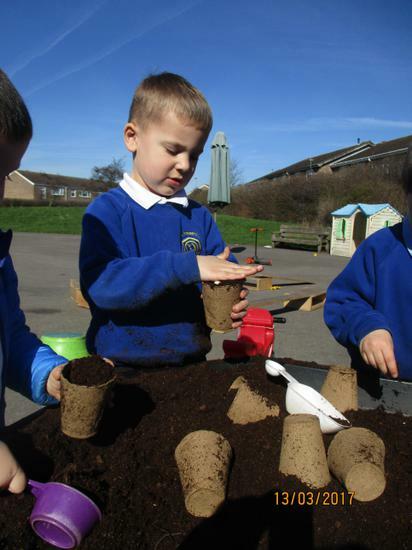 All early years practitioners at Winhills Primary Academy plan and assess learning according to the Development Matters document. 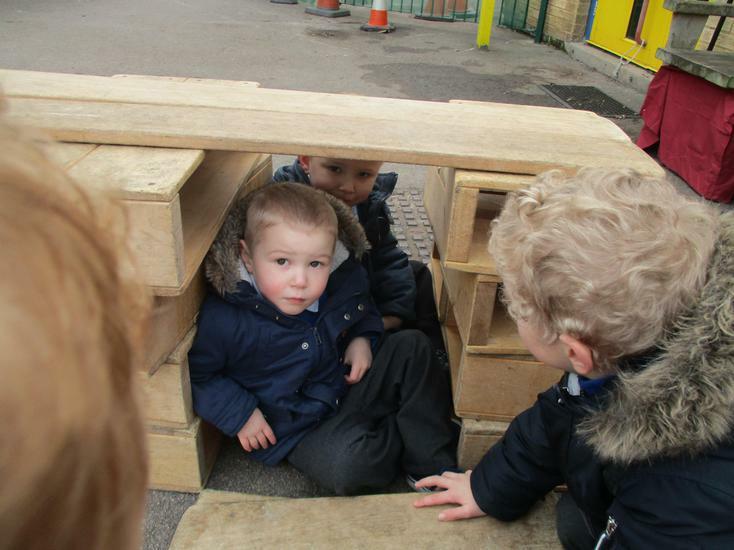 The children have been talking about who lives at home with them. 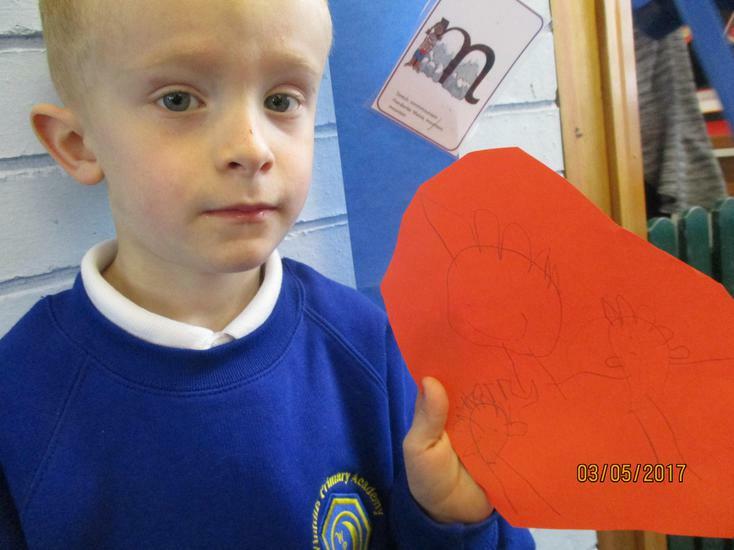 Also they have had a go at drawing the people and pets who make up their family. 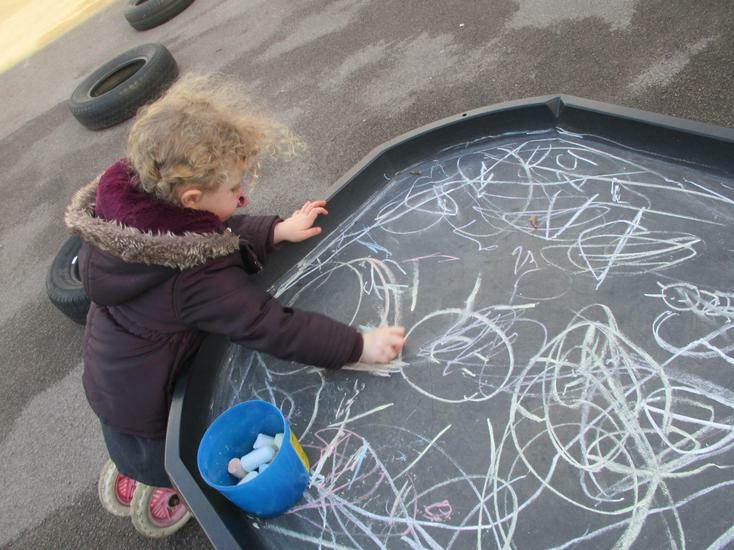 Staff have had some lovely conversations with the children about this. 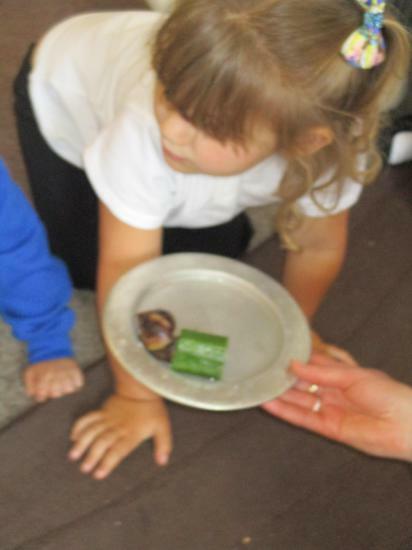 Please encourage your child to bring in a photograph of the people and pets who share their home as we would love to add it into their Learning Journey folder along with their own picture. 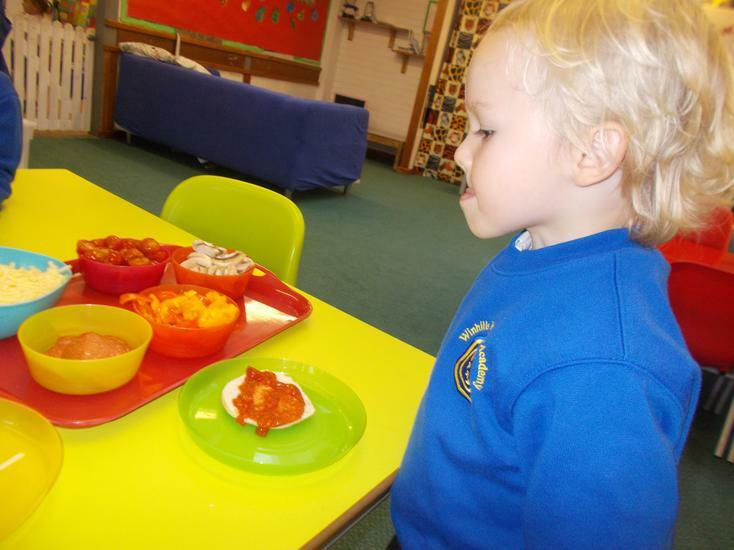 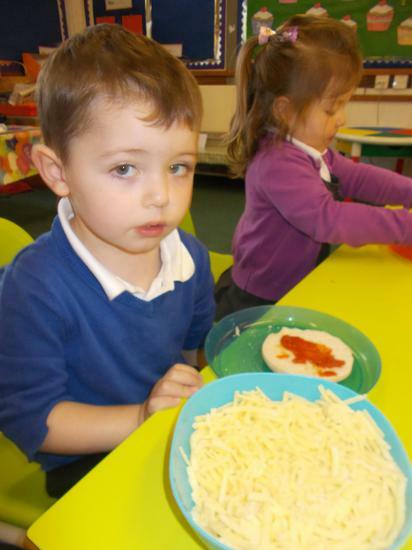 The children have enjoyed making muffin pizzas, playing outside and exploring the inside of pumpkins. 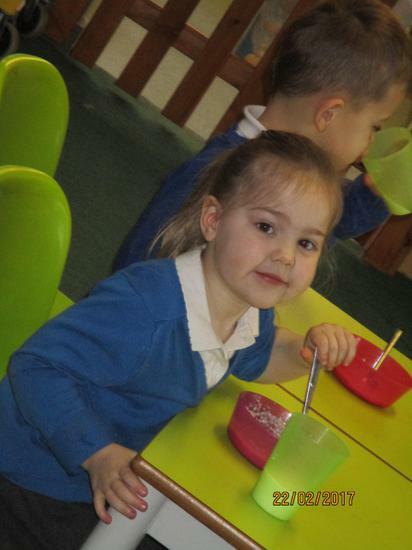 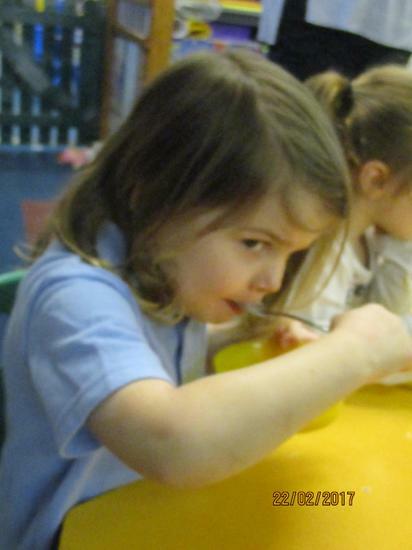 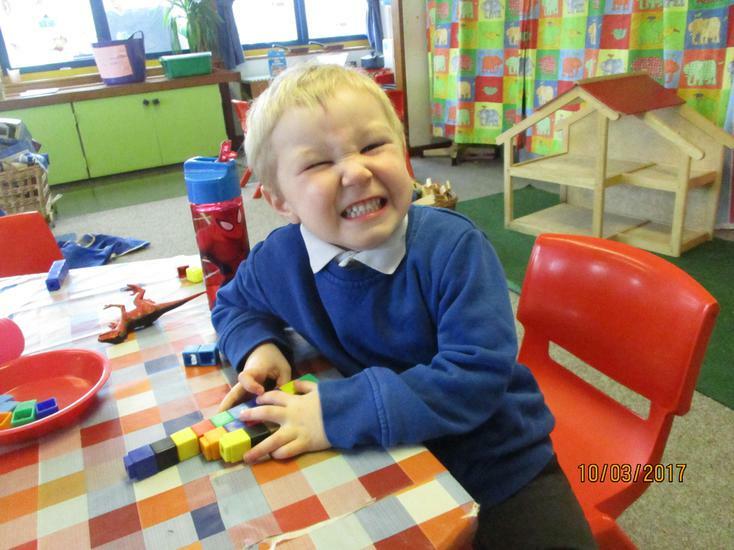 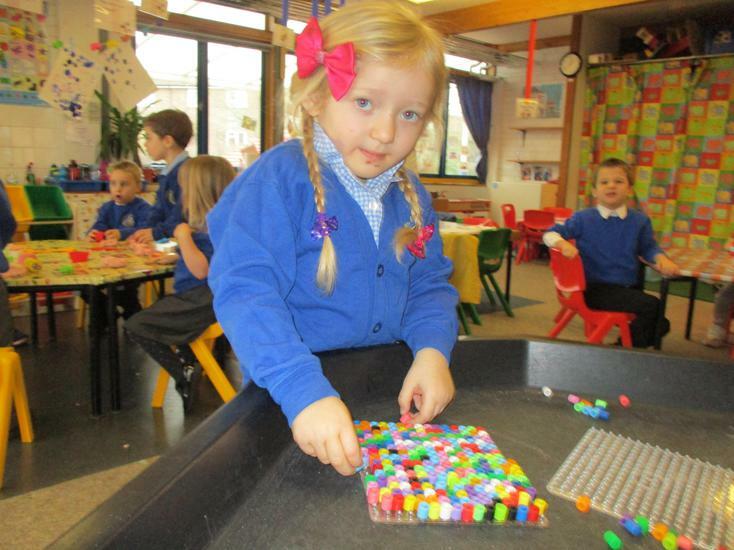 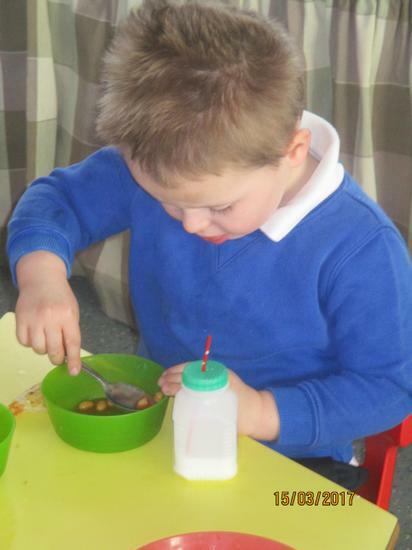 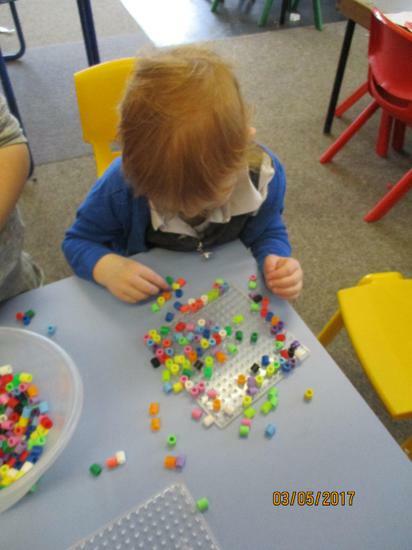 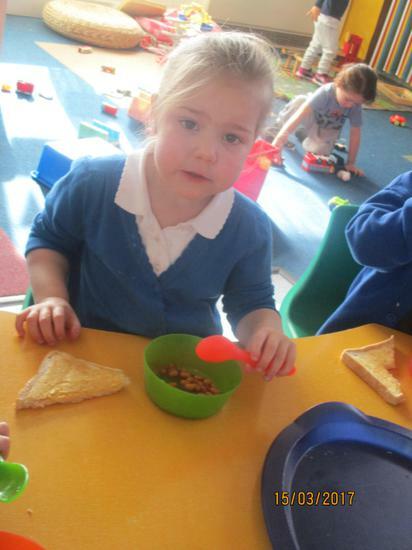 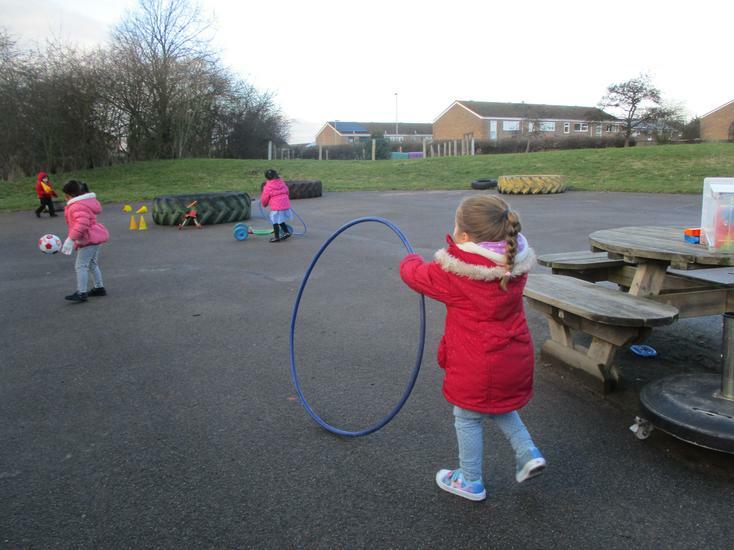 The children have come back refreshed and eager to get busy at nursery after their half term break. 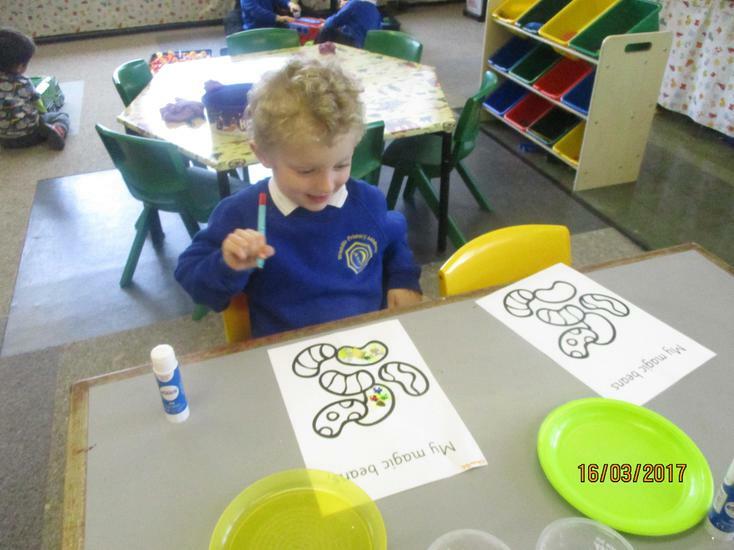 Lots of them have been sharing about dressing up for Halloween and seeing lots of fireworks. 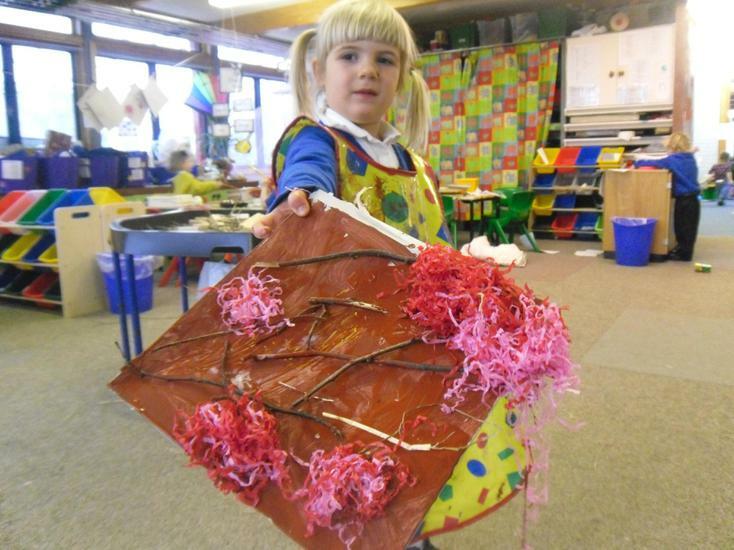 The children this week have been creating lots of different firework pictures and learning about Bonfire Night. 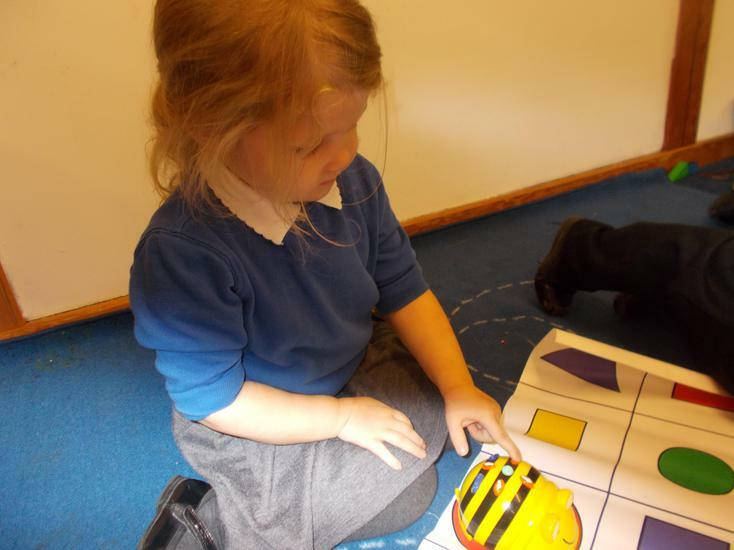 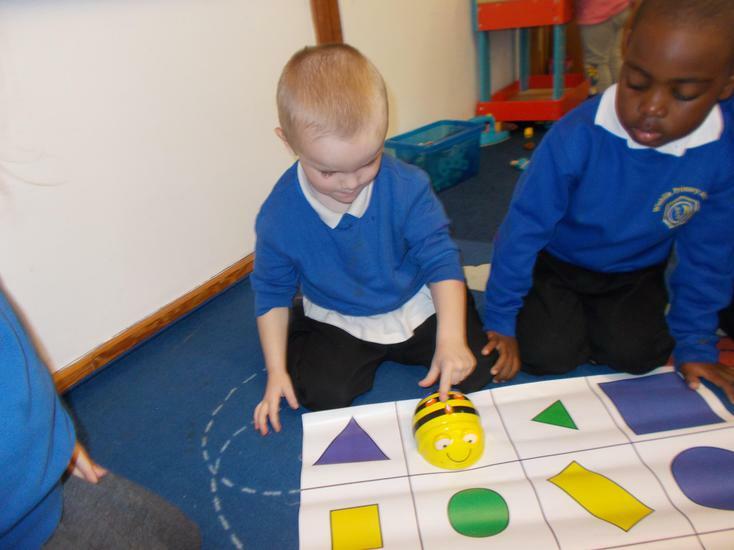 Also the children have been playing with the Bee-bots. 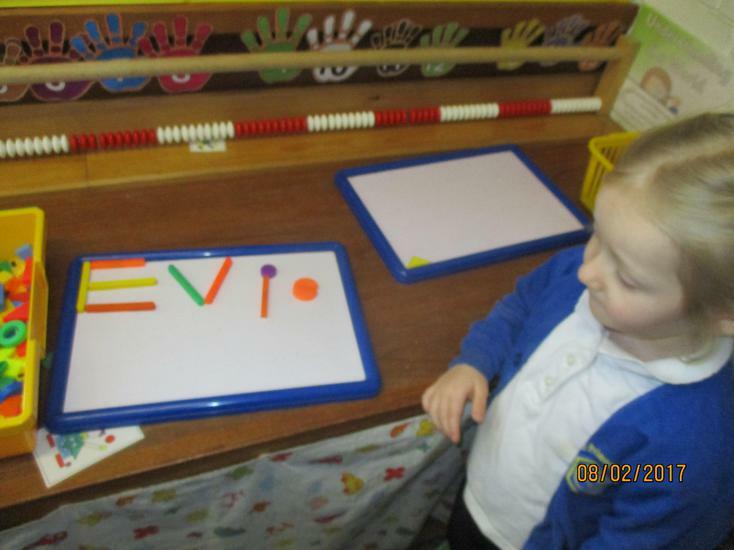 The children have been busy singing ‘Five Little Fireworks’ and practising counting forwards and backwards. 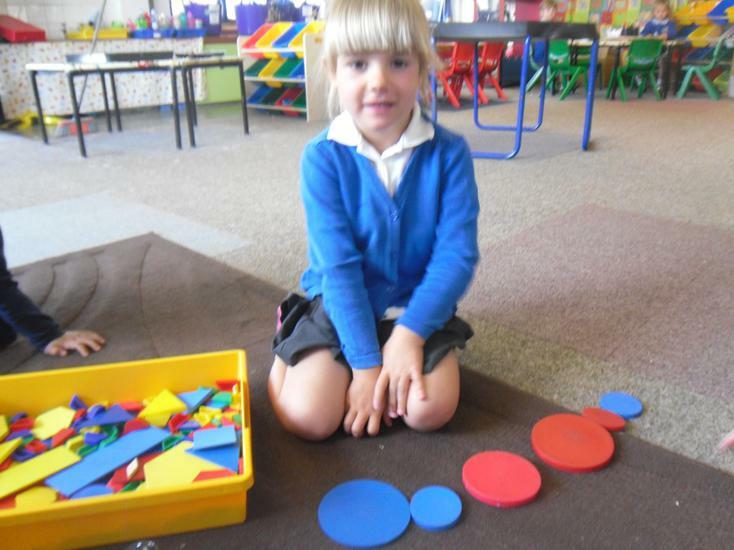 Also we have been sorting and matching flat 2D shapes including circles, squares, triangles and rectangles. 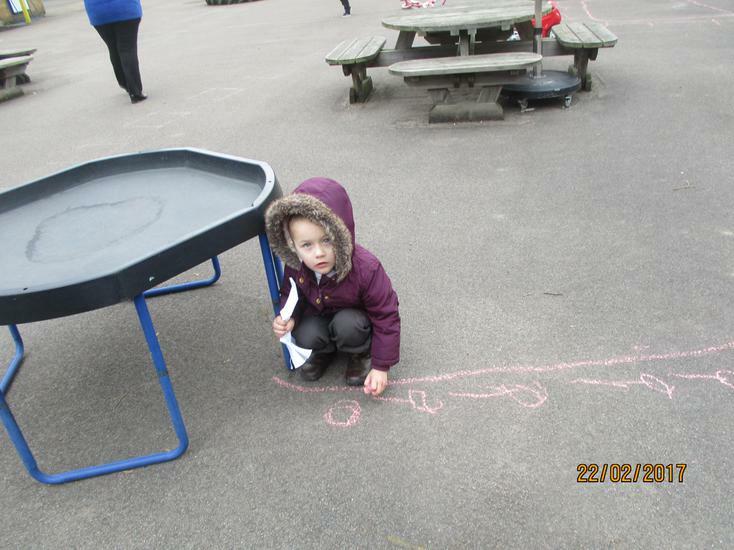 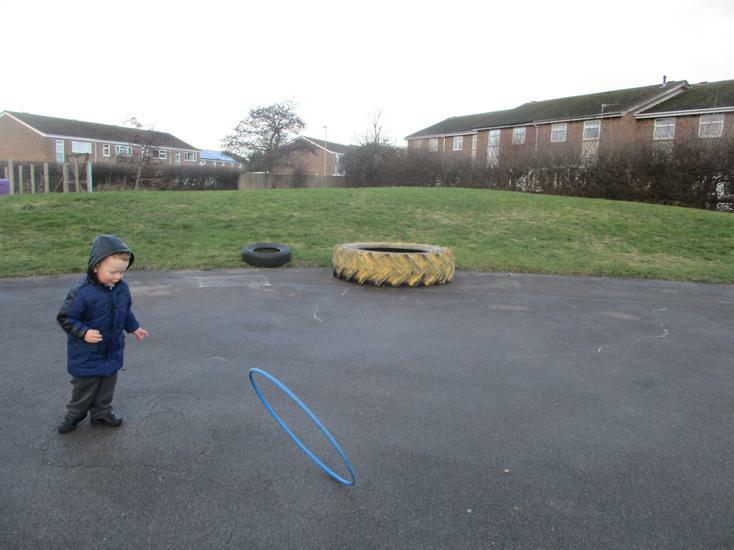 We went on a shape hunt looking for different shapes outside and had a go at chalking shapes on the playground. 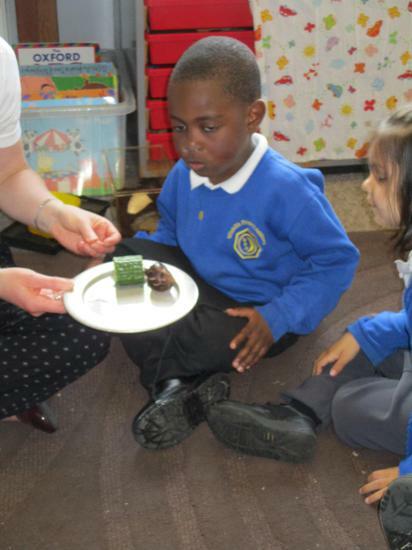 The children have been finding about fireworks and the Indian celebration of Diwali. 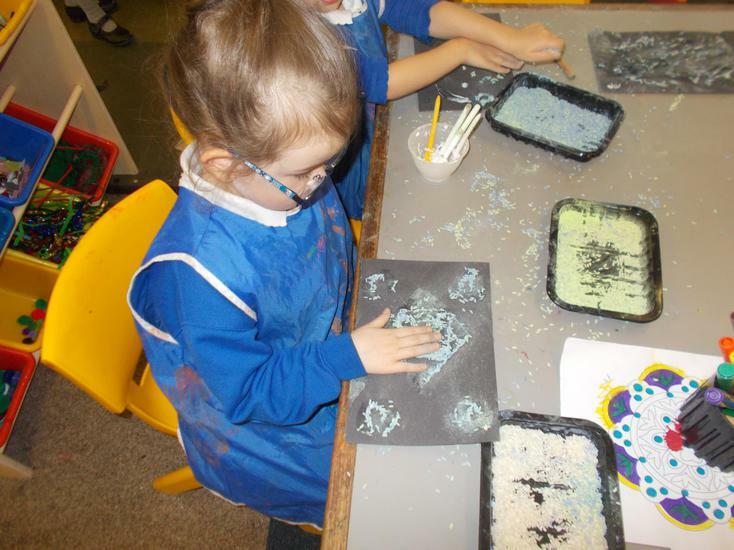 They have made different firework pictures using paint and glitter. 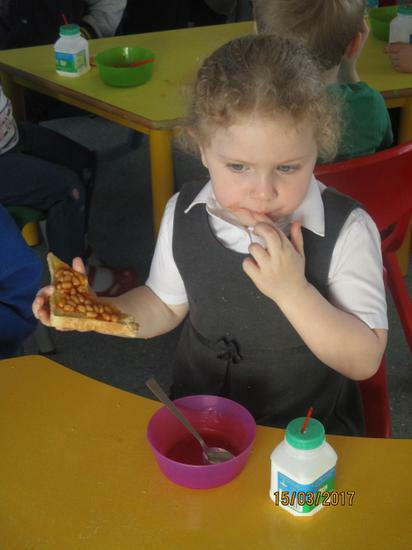 They have also tried some different types of bread including chapittis. 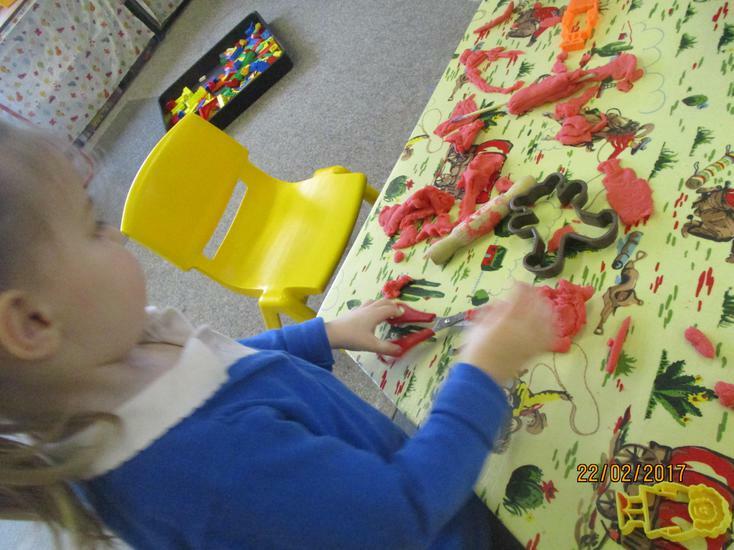 They have made some Diva lamps using sparkly play dough. 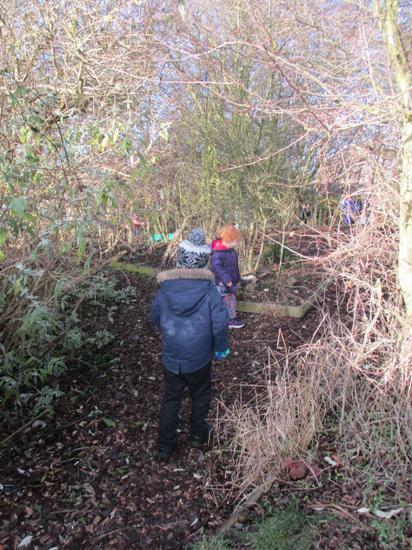 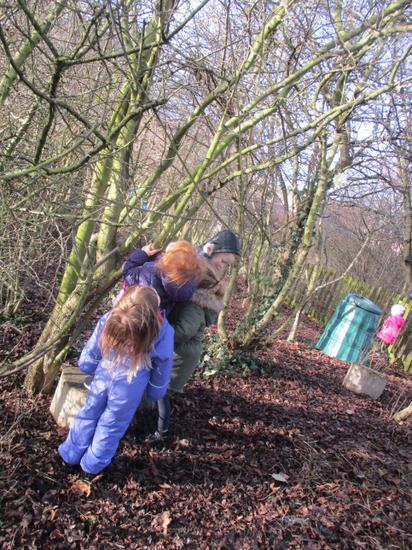 The children have been helping to clear up the fallen leaves using wheelbarrows and brushes. 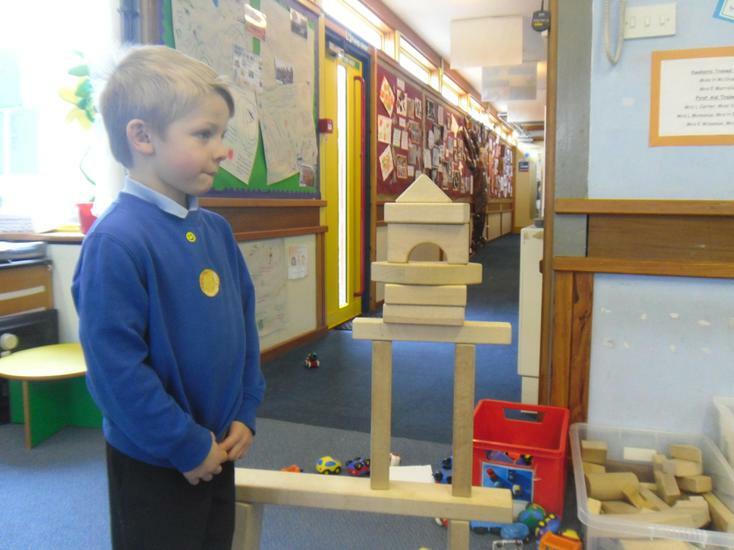 The children have looked at pictures of tall and short building before having a go at building towers. 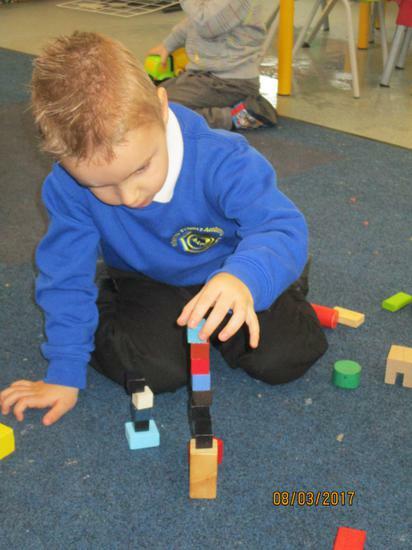 They have been using the language of size to describe their towers including big, small, tall and short. 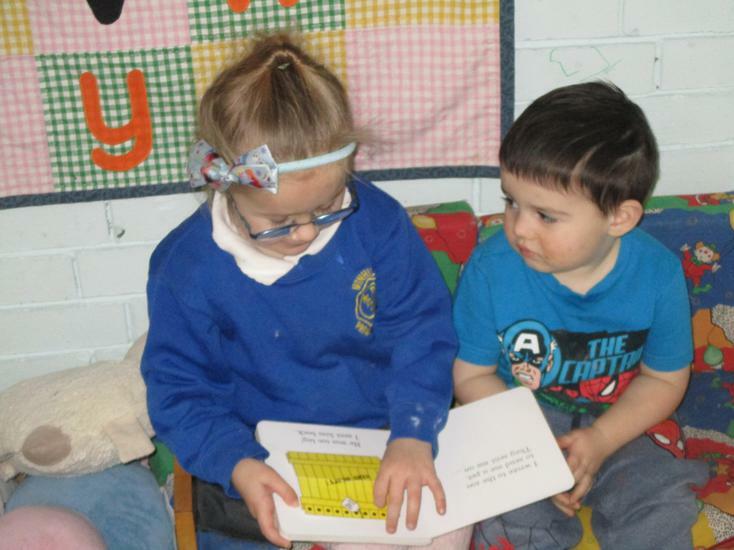 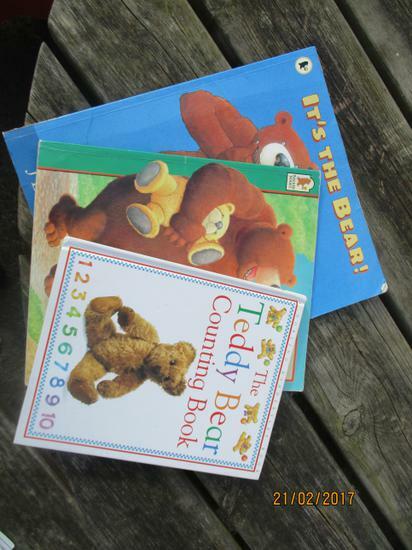 Also they have been listening to the story of ‘The Three Bears’ and talking about big daddy bear, medium sized mummy bear and small baby bear. 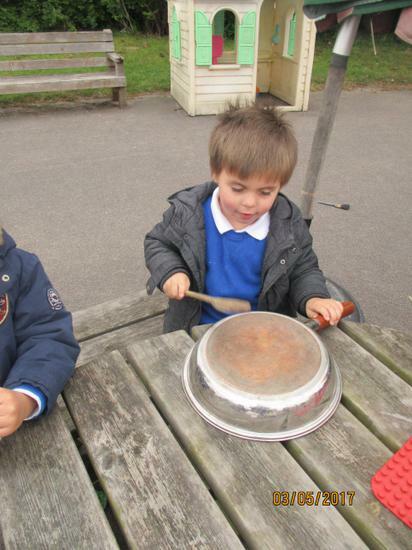 The children have started practising our songs for our Christmas Production ‘The First Christmas’. 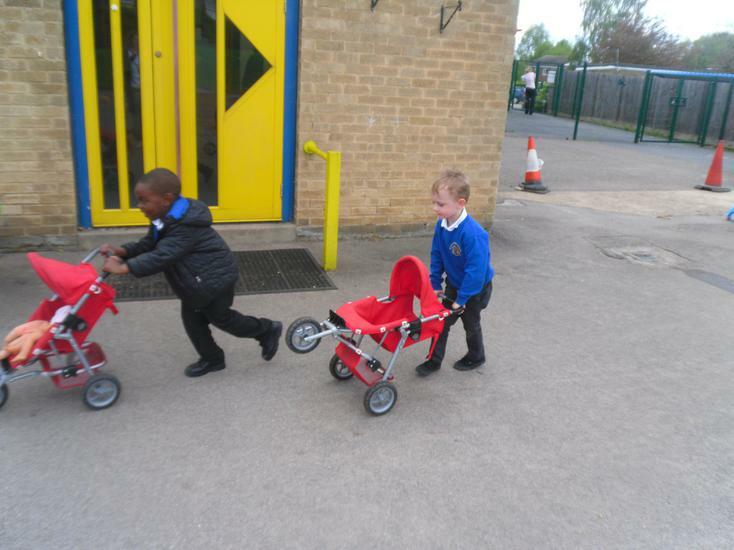 They have nearly learnt them all before we start practising in the hall. 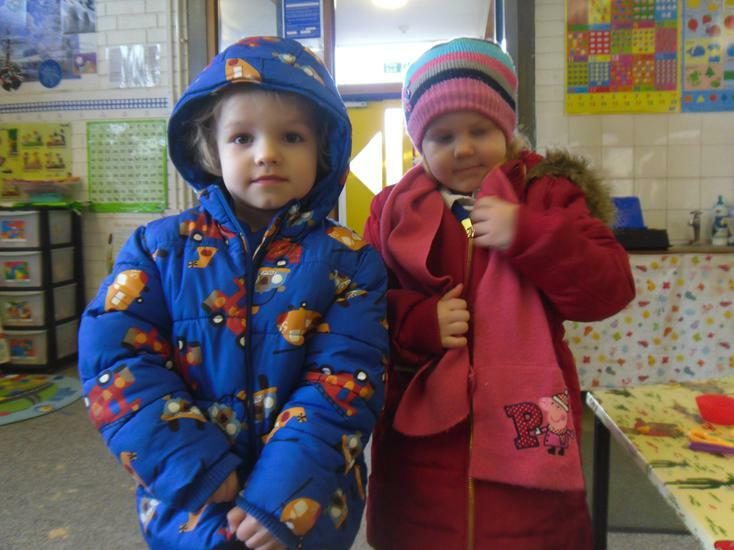 Please ensure your child has a costume ready to bring into school by Tuesday 1st December. 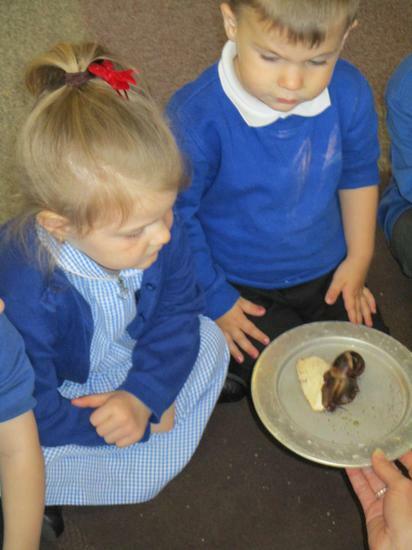 The children have been listening to the story of 'The First Christmas' when baby Jesus was born. 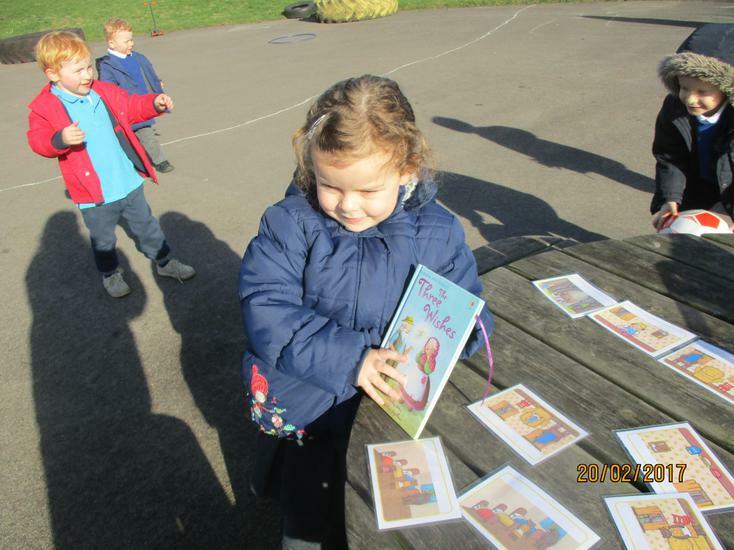 They have been learning about the characters in the story. 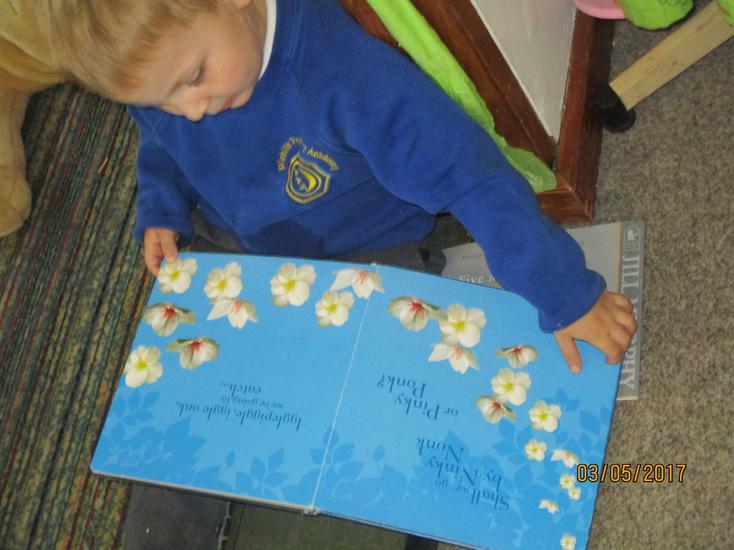 Also they have listened to other stories about Winter as well as Christmas including 'Dear Santa' and 'One Snowy Night'. 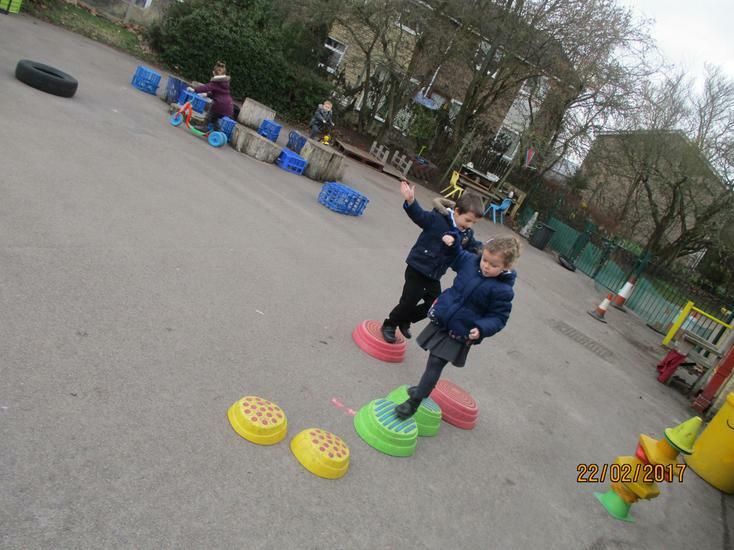 They have been practising for their Christmas Performance in which they are retelling the story of 'The First Christmas' through lots of songs. 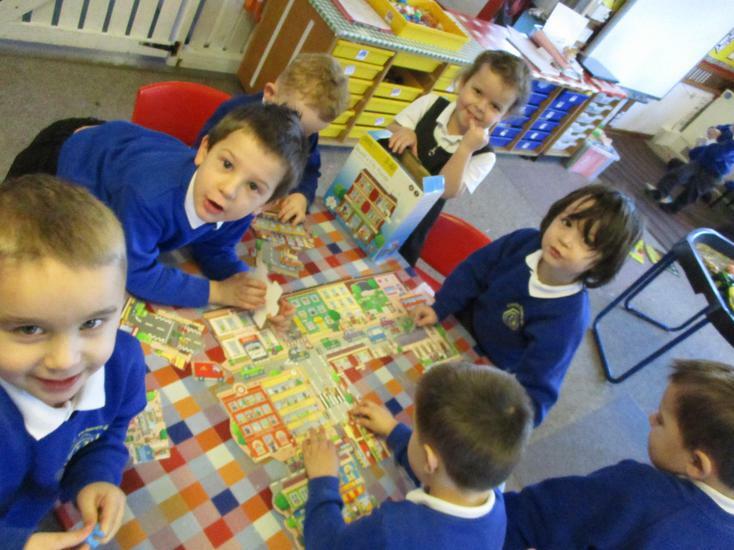 We have started counting the days until Christmas day through our Advent calendar when the children are taking turns to open a door each day and receive a chocolate. 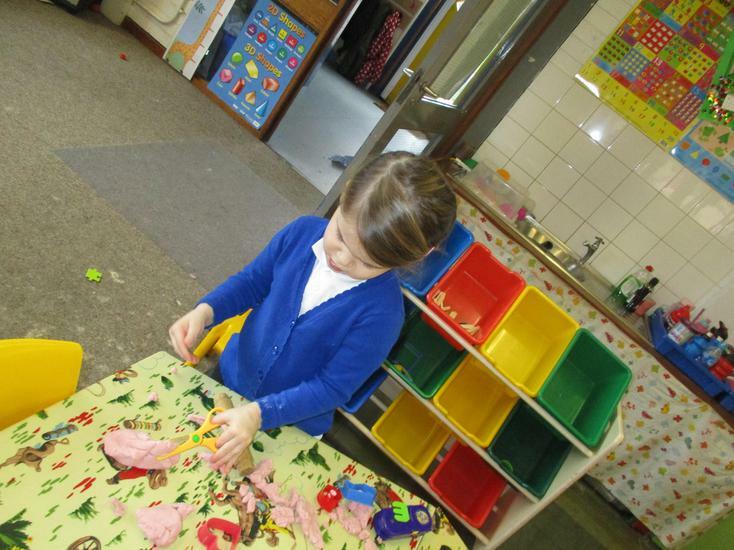 We have been making lots of different decorations to decorate Nursery so please come and have a look! 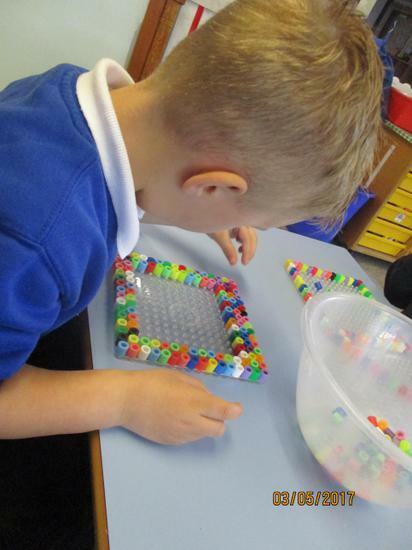 Our new topic is 'Homes'. 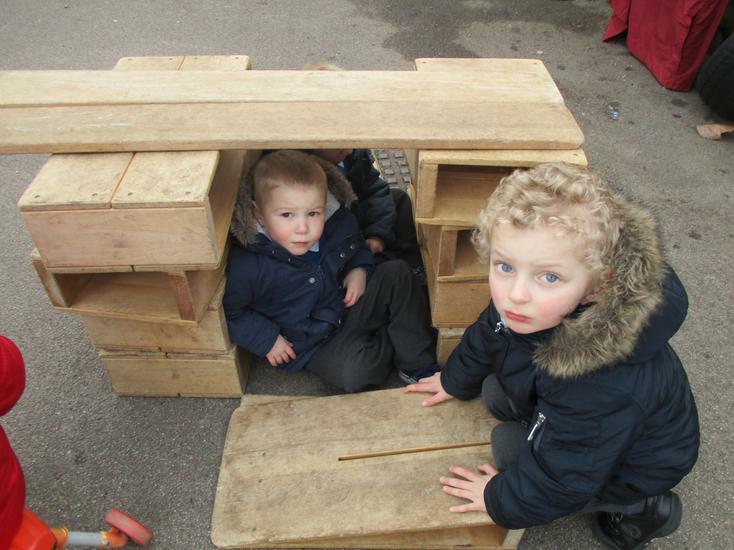 The children have been talking about where they live and if they live in a flat or a house. 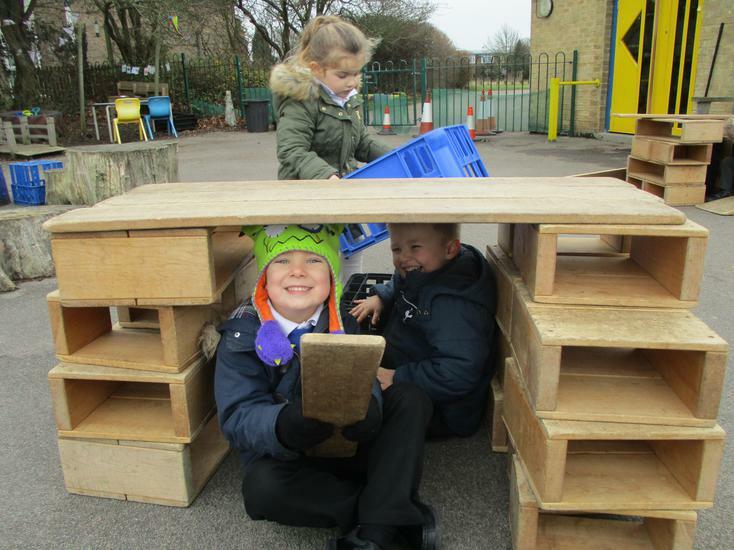 They have painted homes, stuck paper rectangles onto house outlines to create pictures and started painting boxes to make some 3D houses for our display in the long corridor. 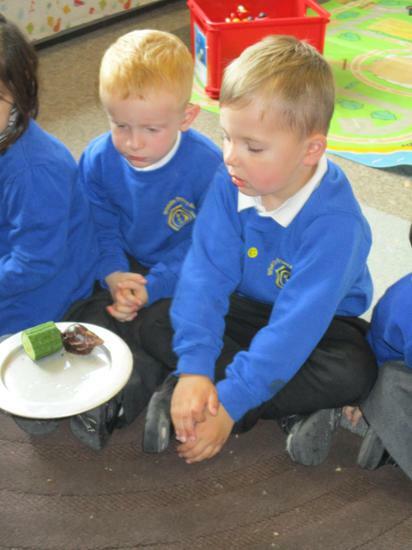 The have really been enjoying listening to and joining in with the story of 'The Three Little Pigs' this week. 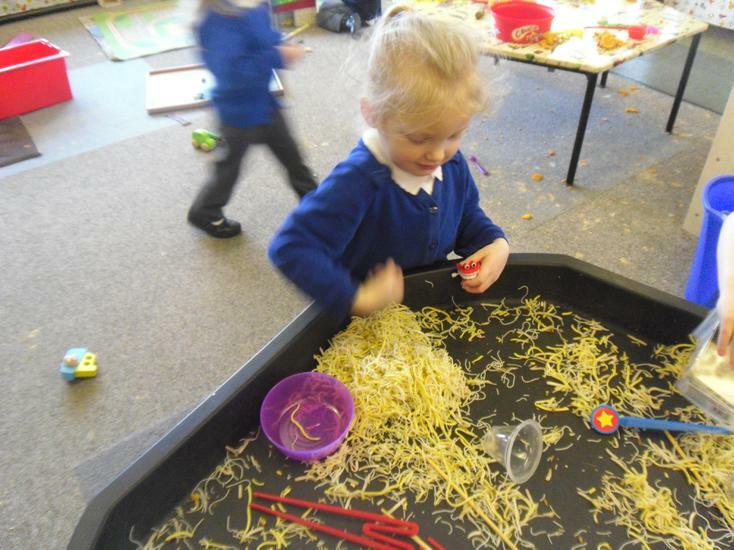 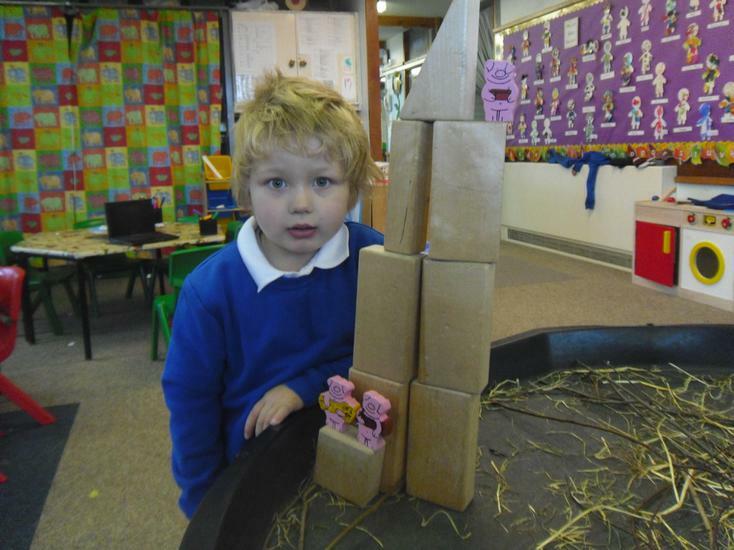 They have been playing with straw, sticks and various different types of bricks building homes for the little pigs. 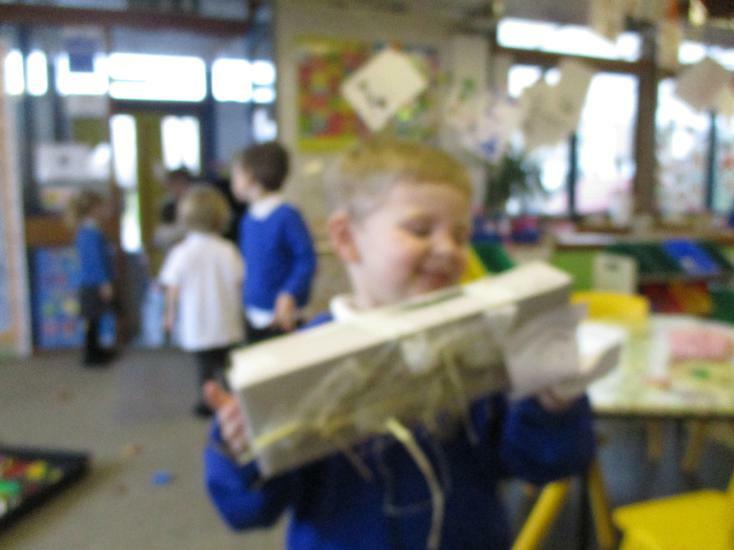 There has been lots of huffing and puffing and I will blow your down going on! 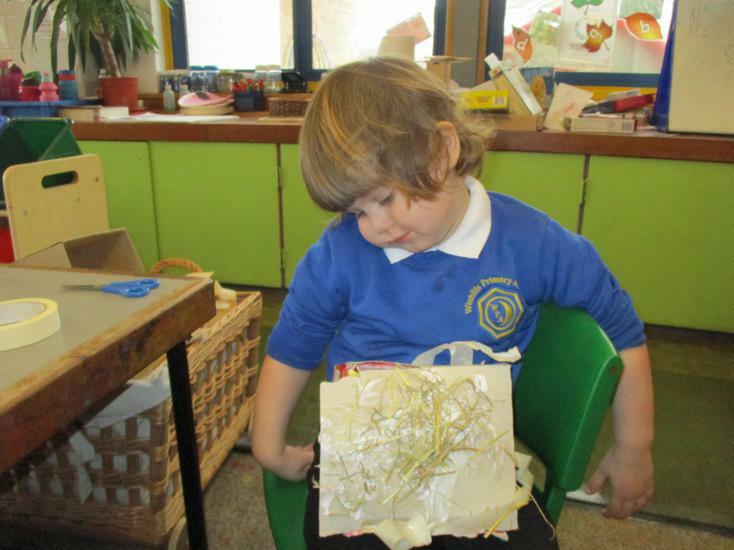 Also the children have been very creative making houses out of boxes, painting them and adding straw or sticks. 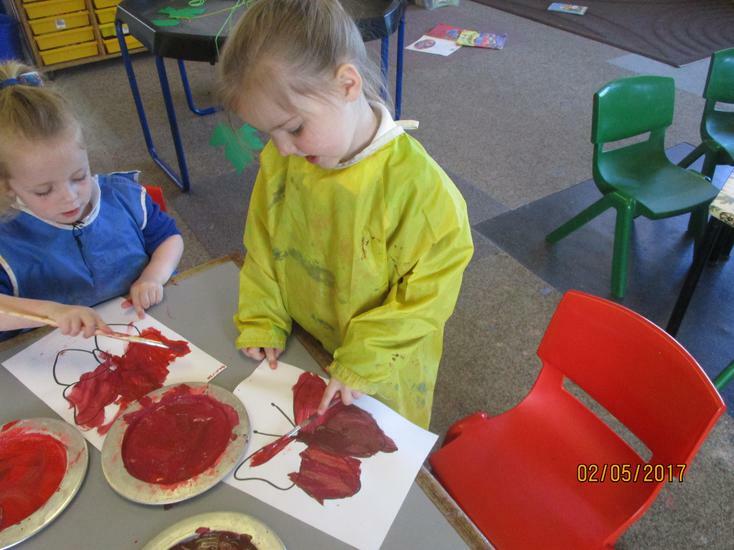 The children have been enjoying finding about the celebration of Chinese New Year. 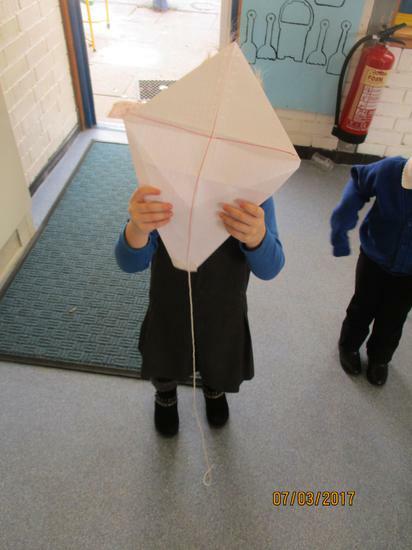 They have tried some Chinese food, used chopsticks to pick up noodles in the tuff mat, created Chinese lanterns, folded red money envelopes, made fans and joined in with a dragon dance. 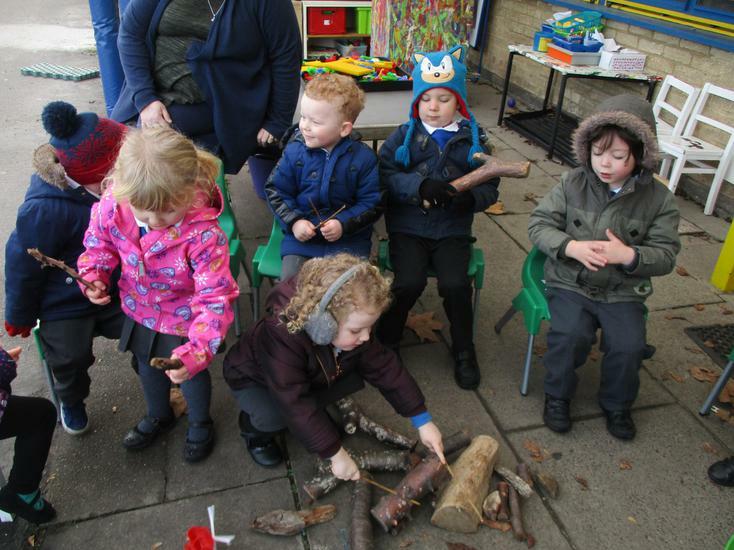 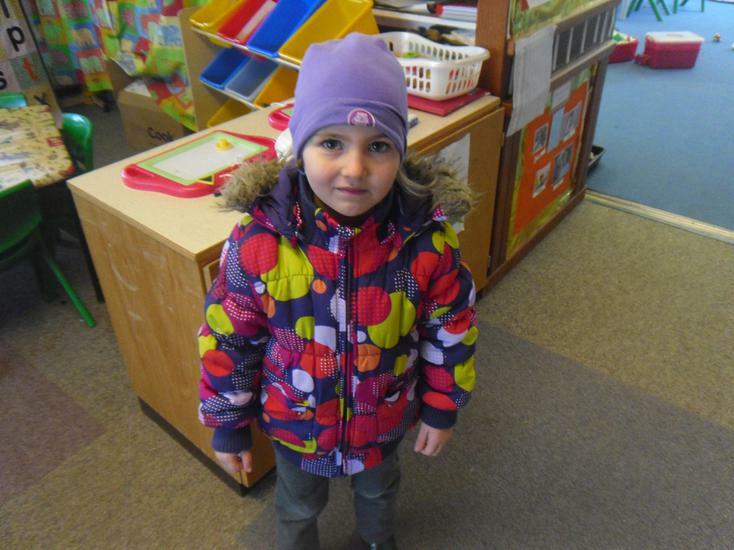 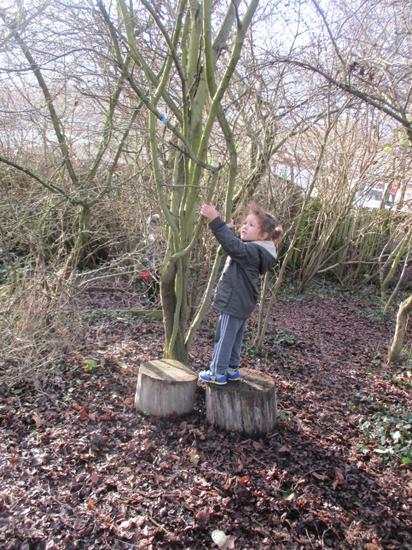 Also we have been encouraging the children to put on they own coats, hats, scarves, gloves and wellington boots to develop their own independence. 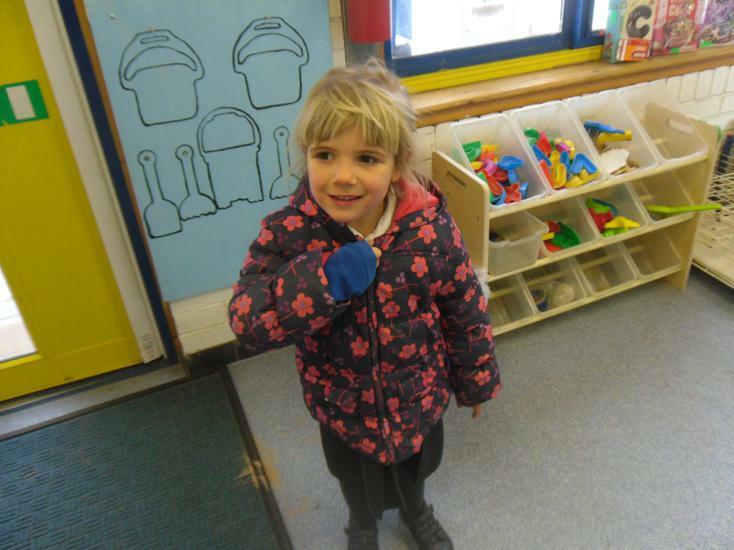 We have been taking photographs of the children who can now independently do up their own zip or buttons on their coat. 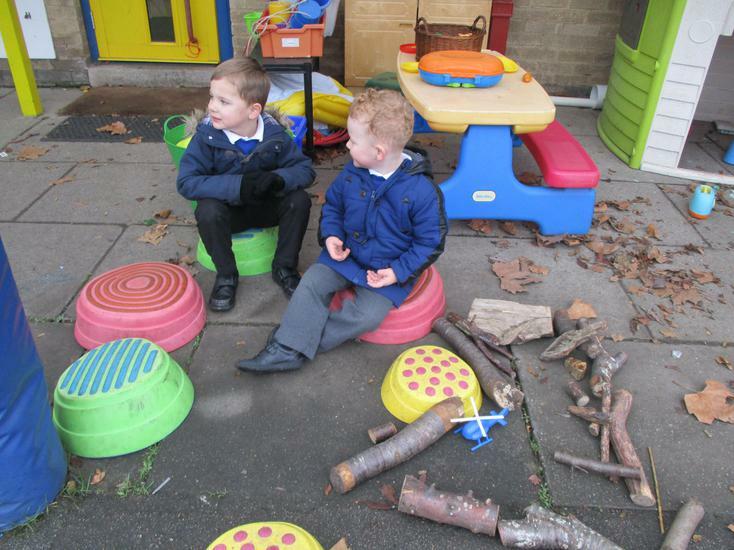 We can put on our own outdoor clothing! 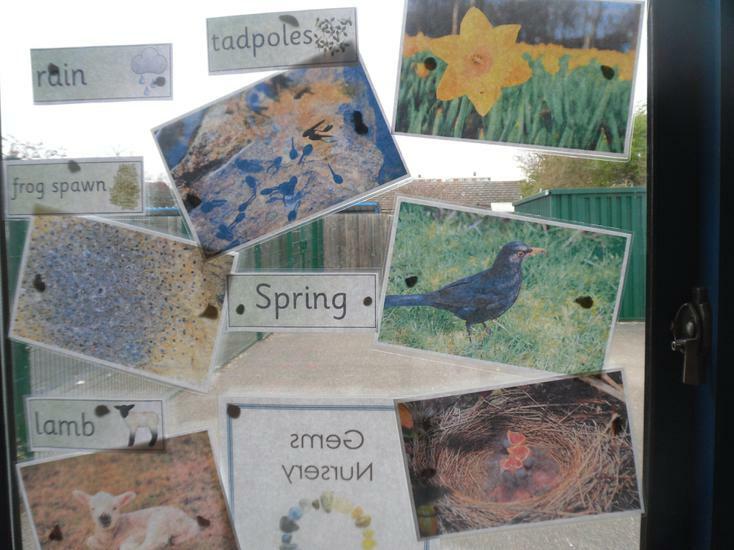 We have many more photographs just inside the door of Nursery so please do come and have a look! 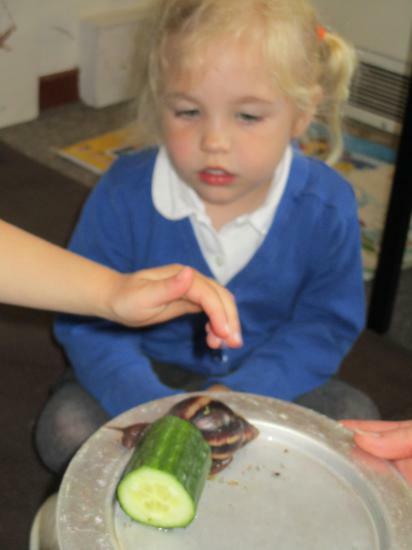 The children have been learning about pets this week and they have been very lucky to enjoy some visits from several different animals. 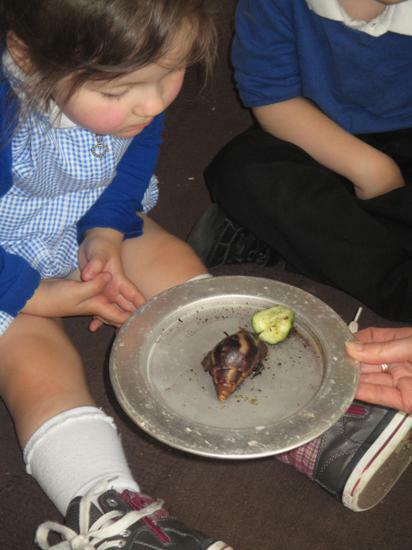 They have stroked a rabbit, seen two Russian Hamsters, a fish and an African Land Snail. 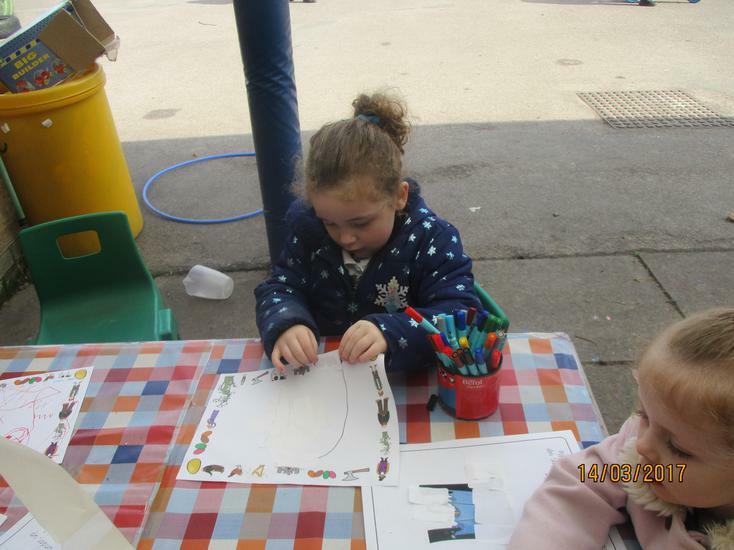 Also many children talked about their own pets and brought in photographs or drew pictures of them. 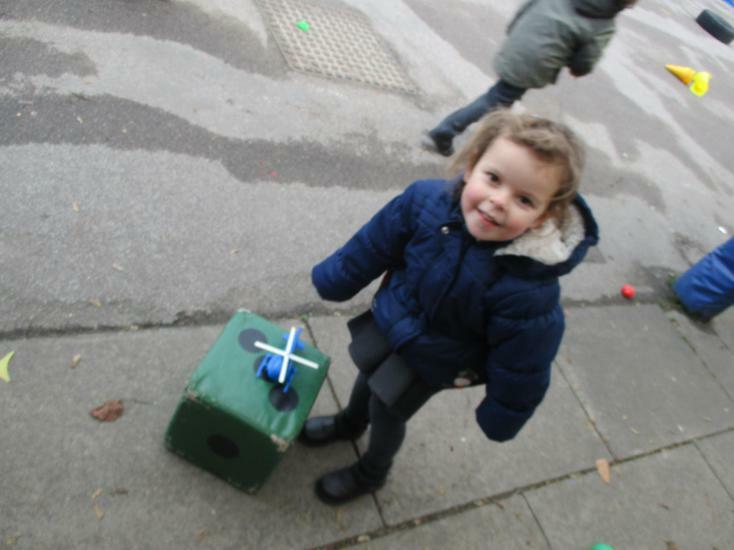 The children have been enjoying playing with the soft toy animals using the bandages, vets set and dressing up as nurses and vets making the poorly pets better. 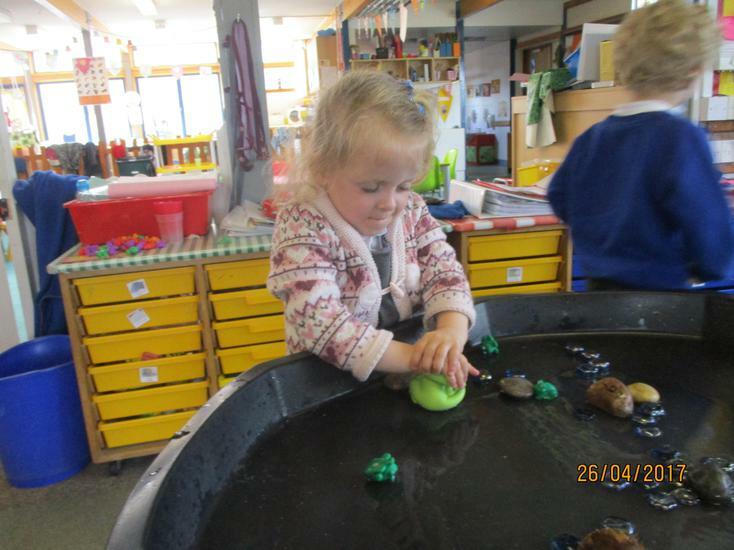 The children have been practising washing their hands and talking about the importance of this. 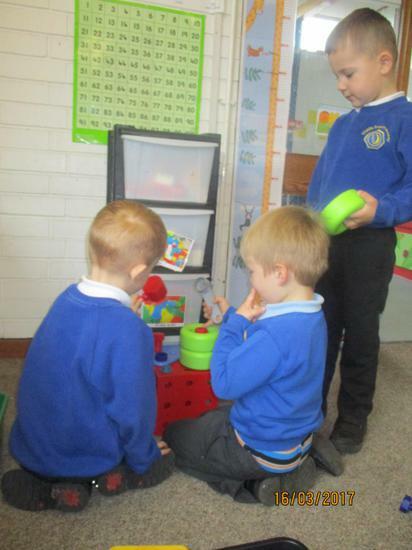 They shared with us that we need to wash our hands after going to the toilet, before we eat, after playing outside and after touching our pets. 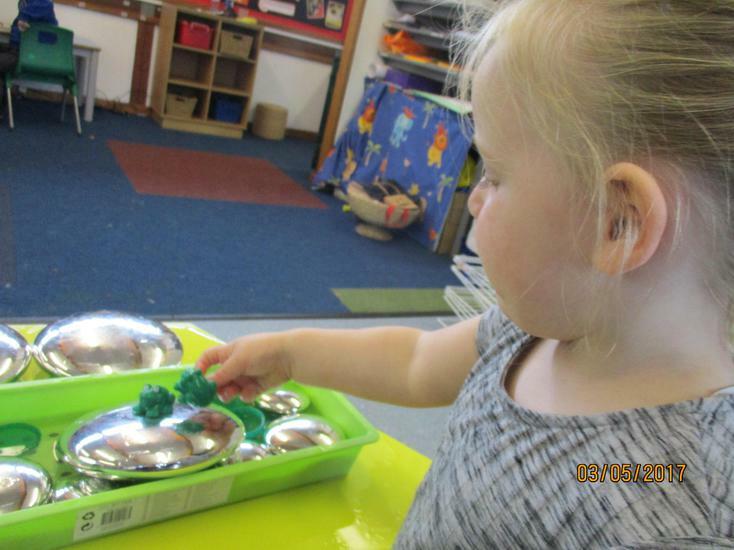 They enjoyed listening to the story 'Wash Your Hands' by Tony Ross about the little princess washing her hands. 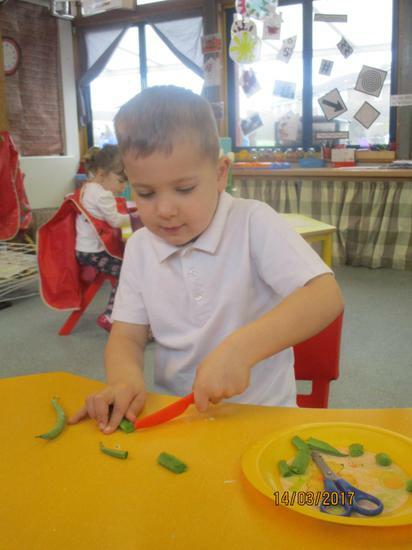 Our Story of the Week was 'Jaspers Beanstalk' by Nick Butterworth and Mick Inkpen and the children loved the last page with Jasper the cat climbing the beanstalk looking for giants. 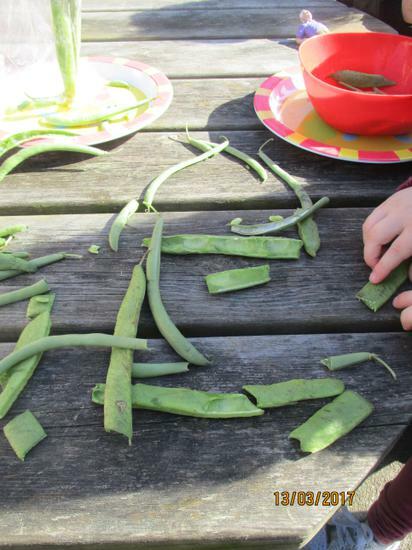 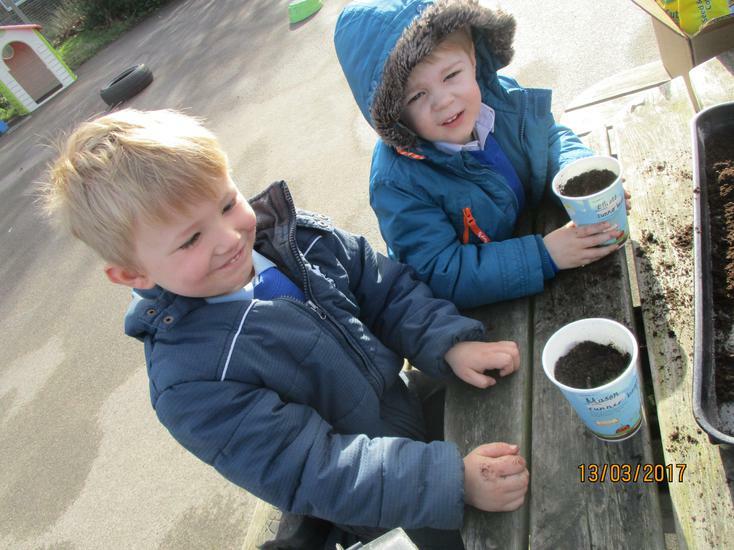 The children have been planting bean and pea seeds in compost, watering them and placing them on the windowsill. 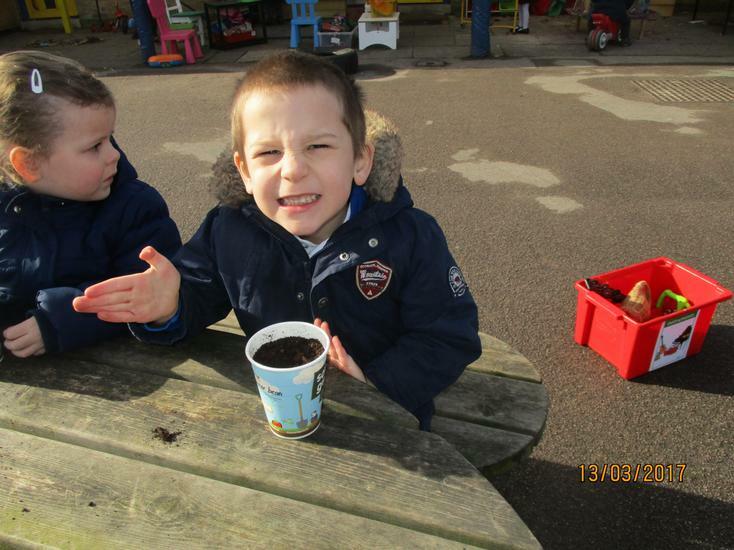 We are hoping they will grow soon and many children have taken their seeds home. 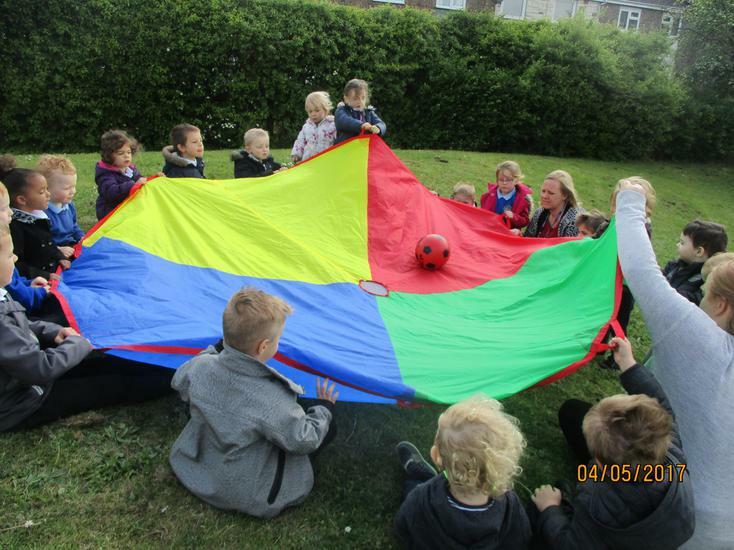 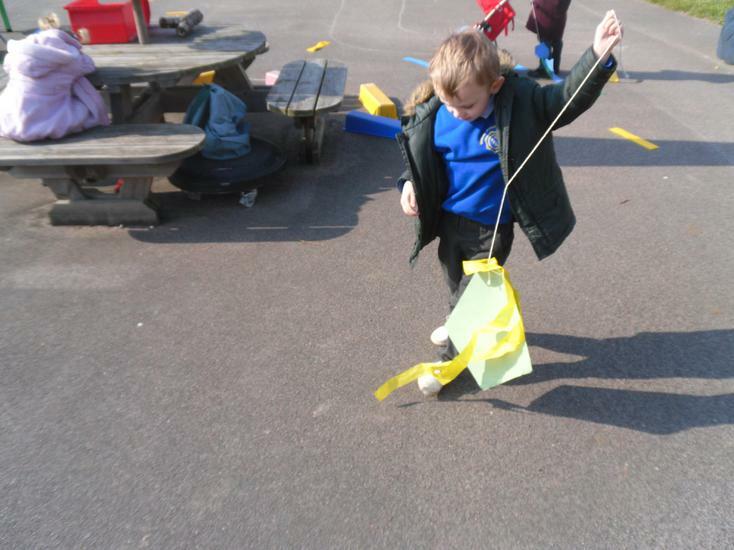 Also as the weather was a little bit windy on Thursday lots of the children made kites outside and tried to fly them. 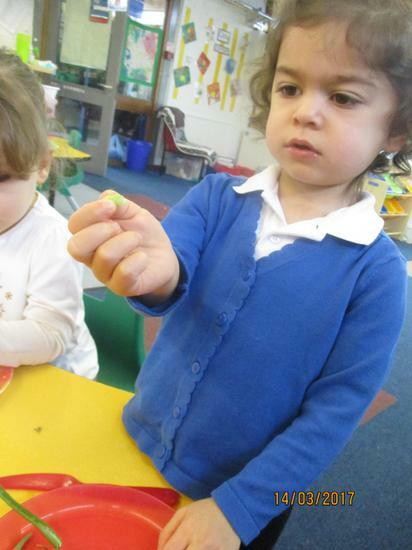 This week we are learning about Easter and the children will be finding out about different kinds of eggs. 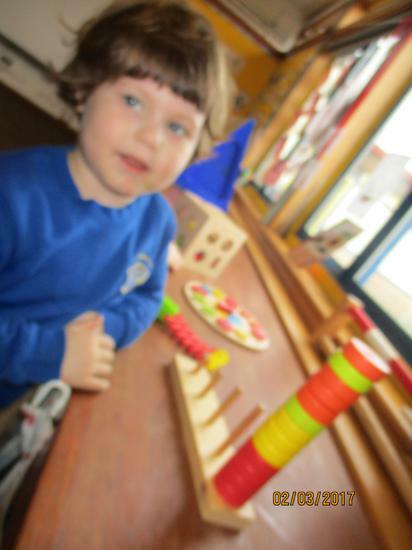 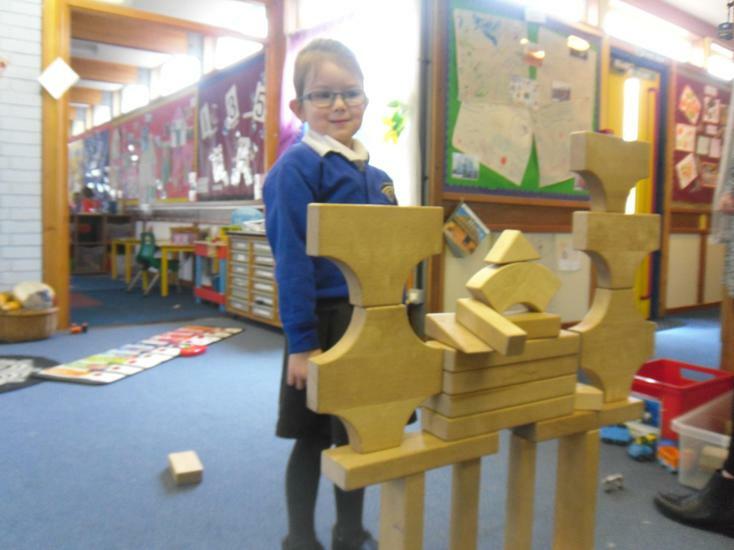 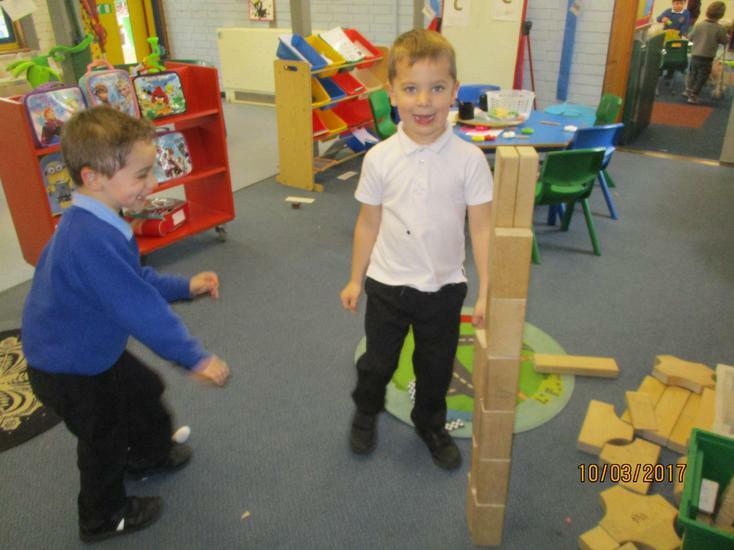 Also the children have been making lots of towers using the wooden bricks. 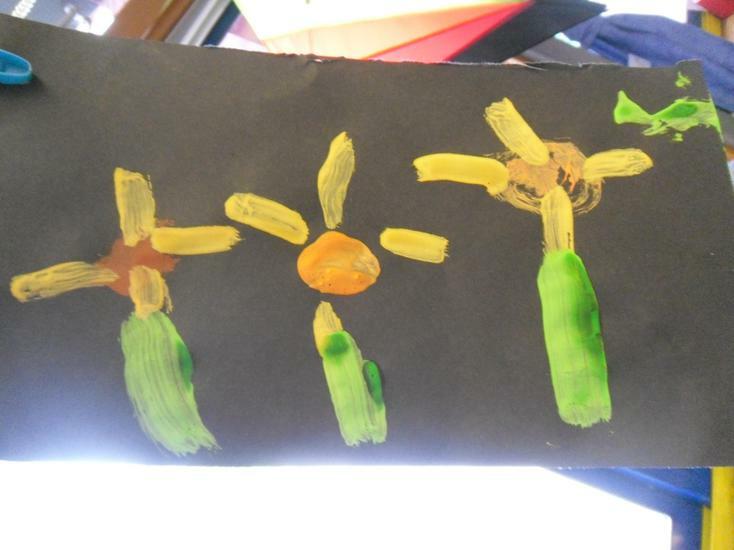 The children have been finding out about the season of Spring. 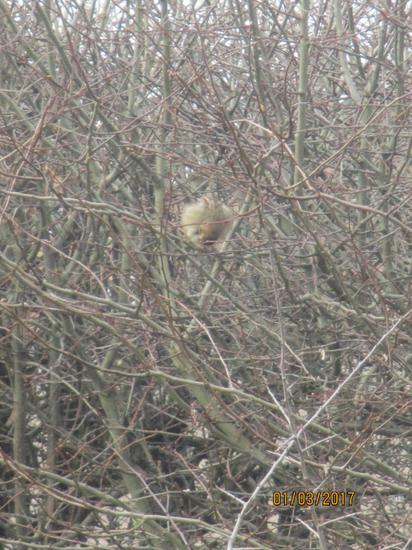 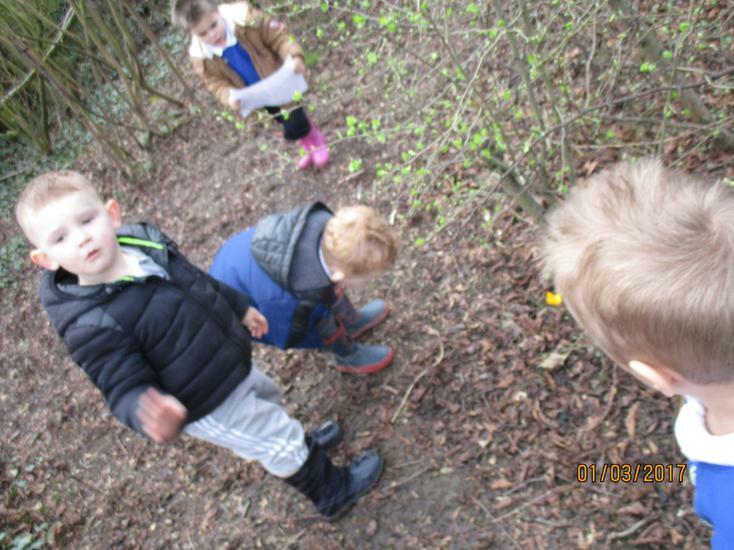 They been outside looking for signs of new growth on the trees, finding daffodils, watching the birds and talking about the weather. 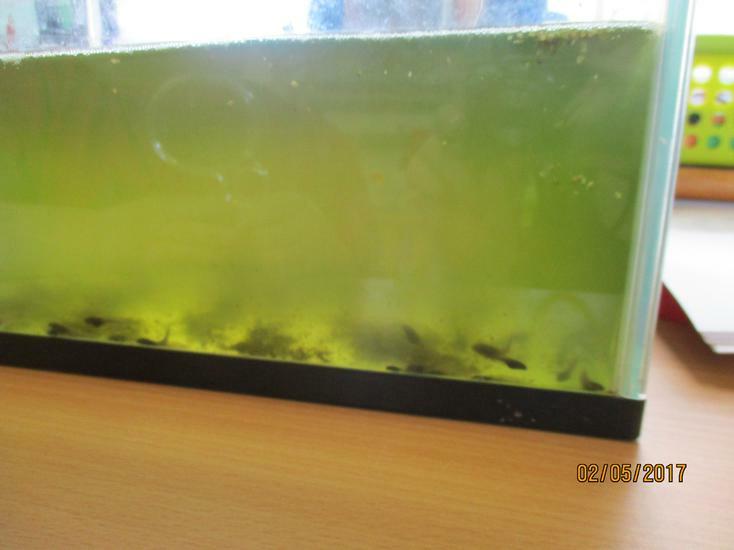 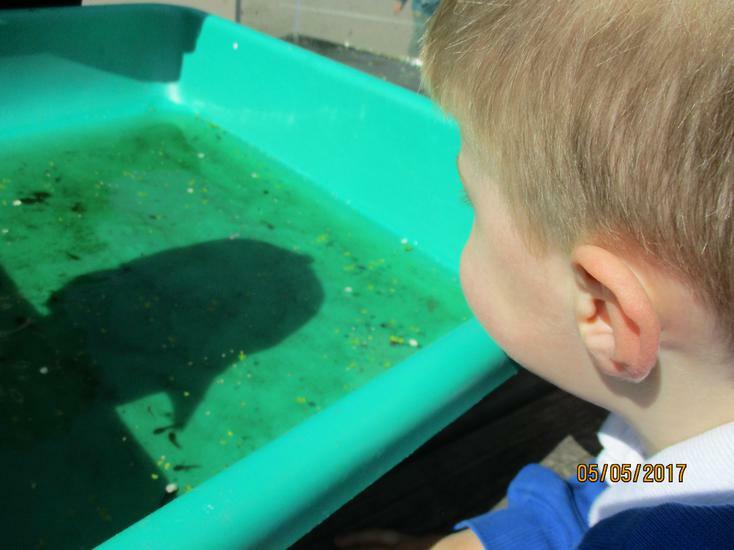 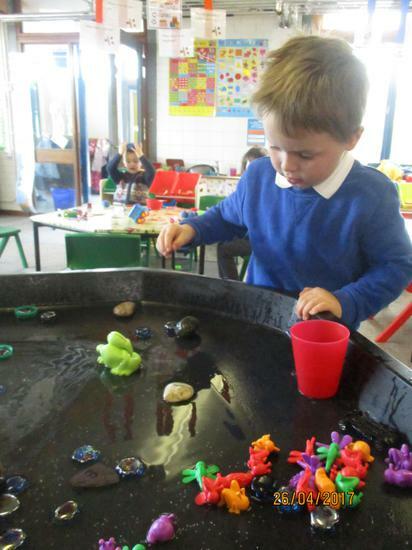 The children have looked at some tadpoles and have talked about that they will eventually turn into frogs. 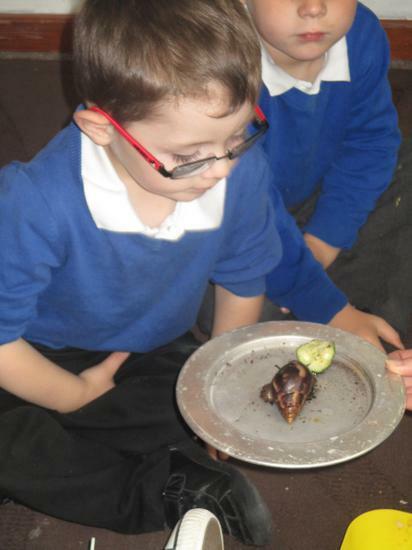 Also we have some very tiny black caterpillars that we are watching carefully and each day they are growing bigger! 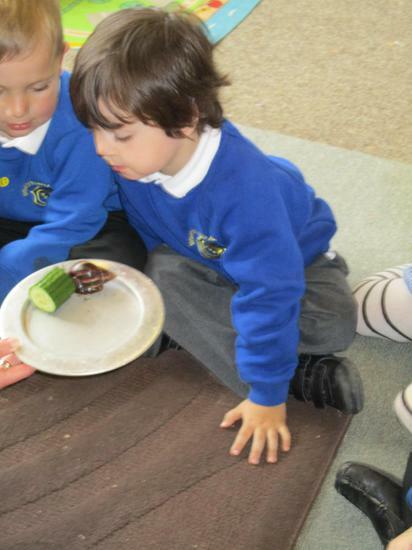 We have read the story of 'The Very Hungry Caterpillar' by Eric Carle so we know what should happen next. 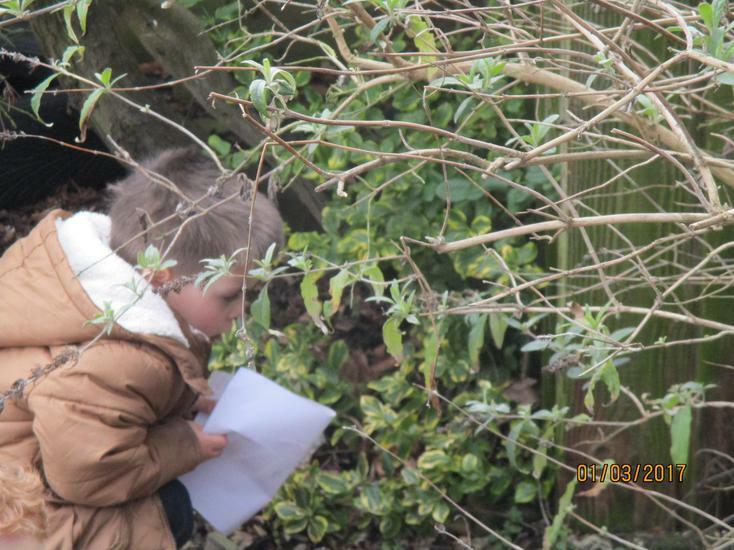 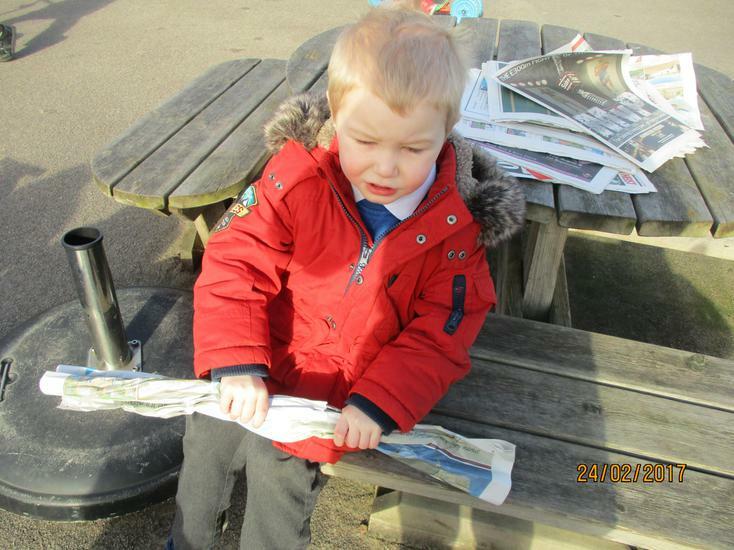 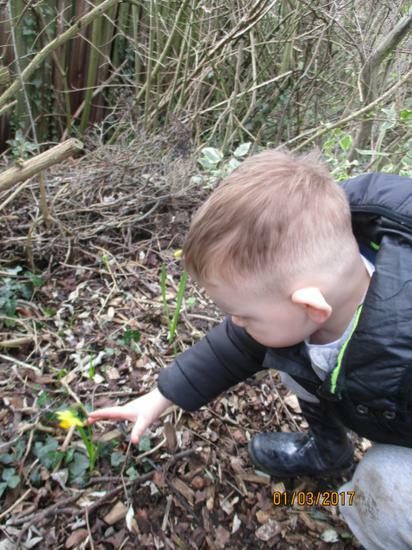 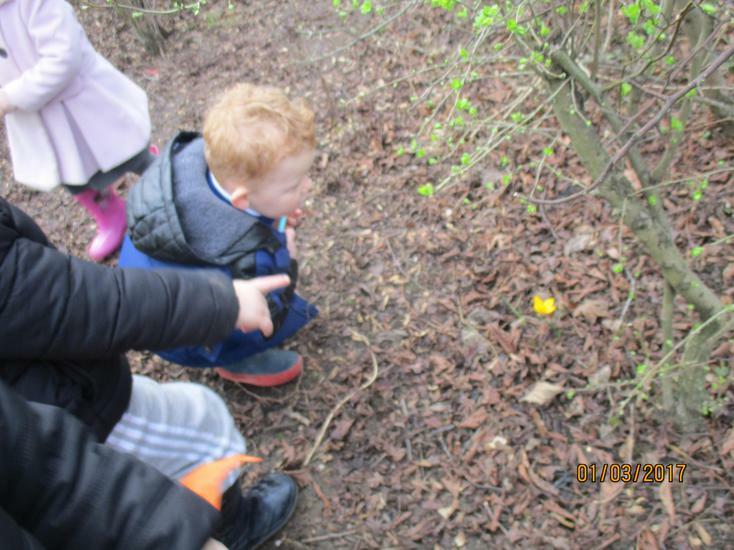 They children have been looking carefully at some different types of flowers including daffodils, blossom and tulips. 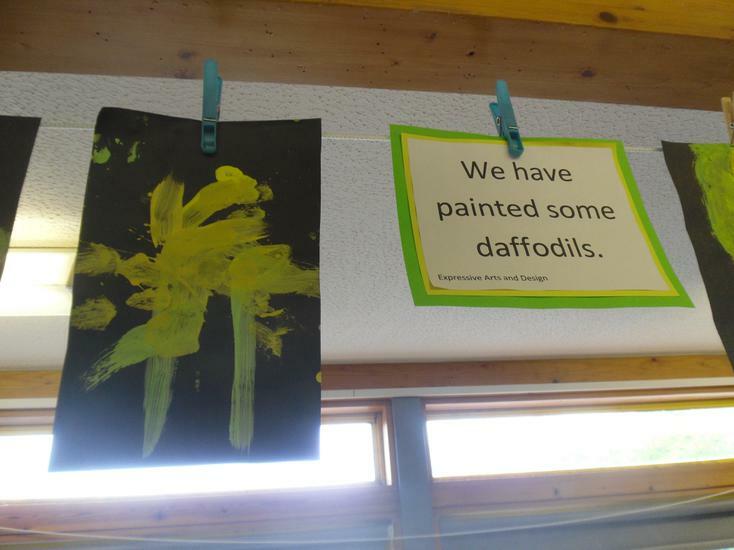 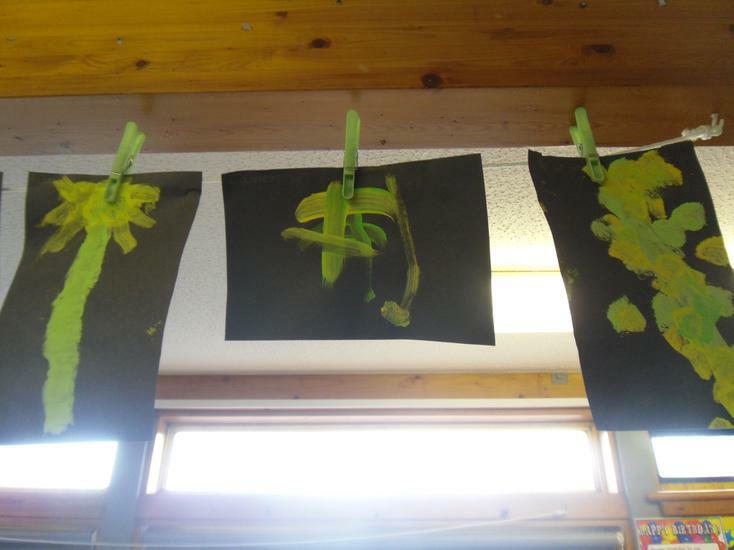 They have tried painting a picture of some of the daffodils. 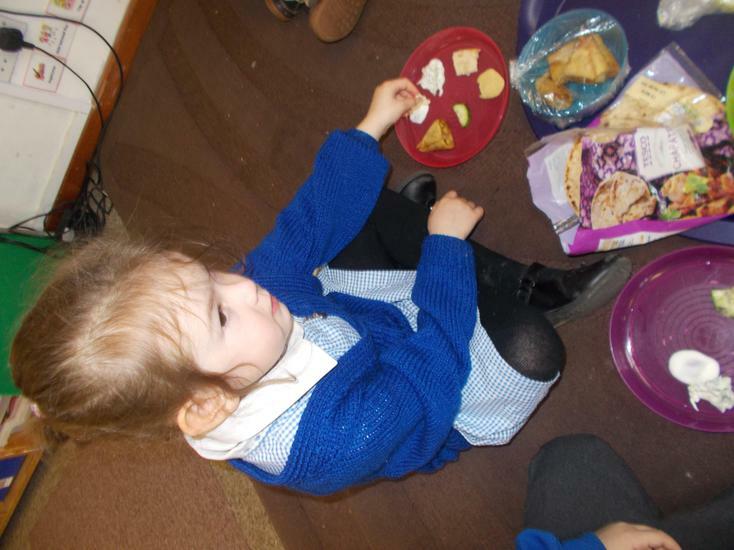 Thursday (21st April) was Queen Elizabeth's 90th birthday so we made cucumber sandwiches and had a tea party. 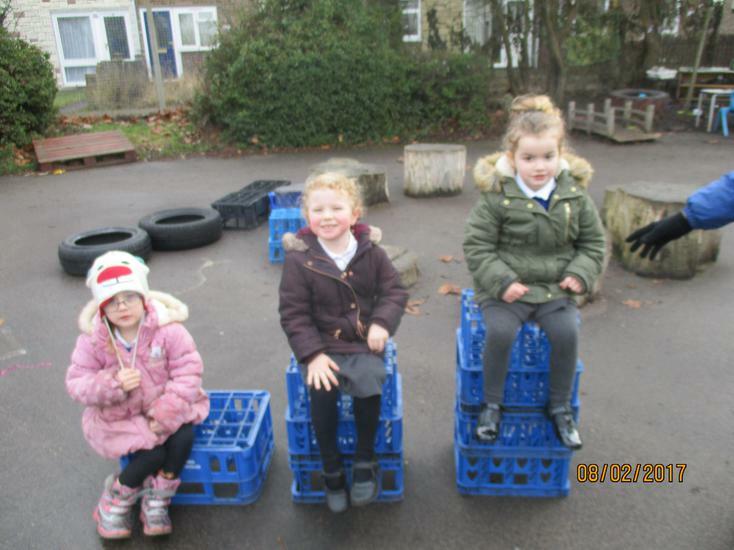 We sang very loudly 'Happy Birthday' hoping the Queen could hear us in Windsor Castle. 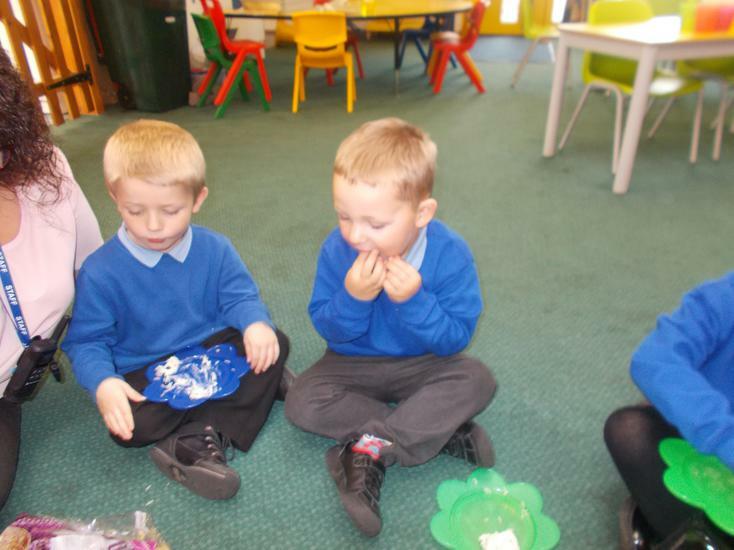 It was very exciting eating cucumber sandwiches, mini sausages and jam tarts. 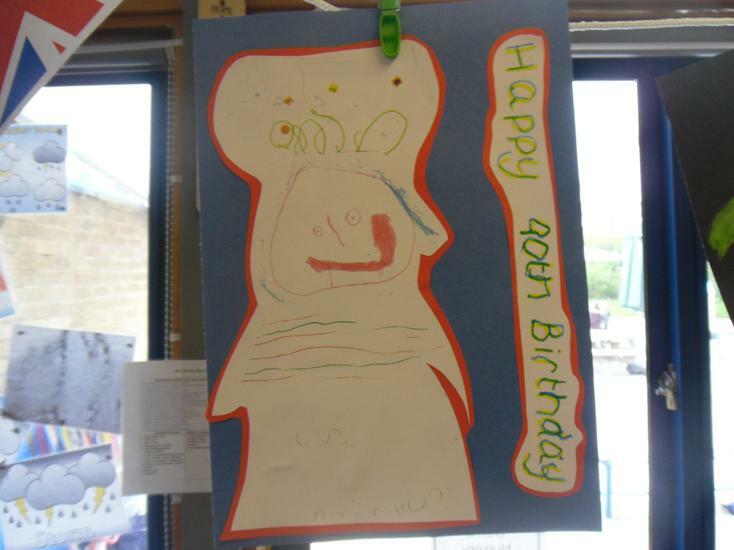 Also the children made paper crowns, drew pictures of the Queen, made bunting and created the Queen a birthday card. 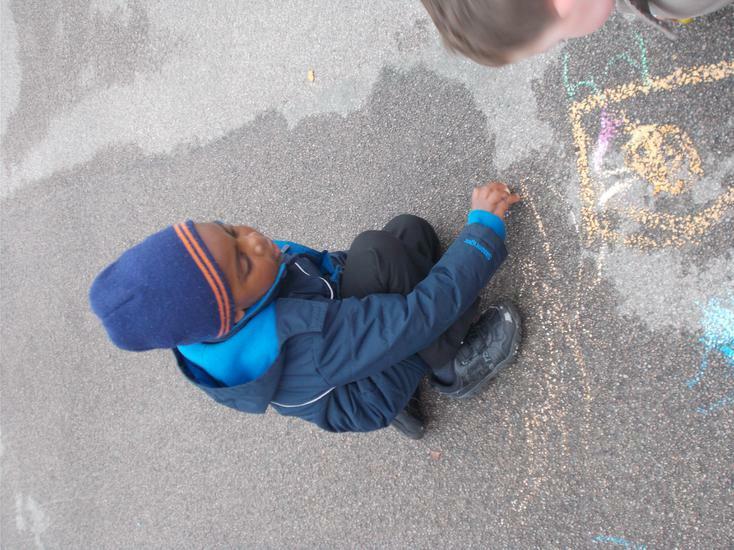 Also the children looked at photographs of the Queen, Buckingham Palace, Windsor Castle, her crowns, the corgis and other members of the royal family. 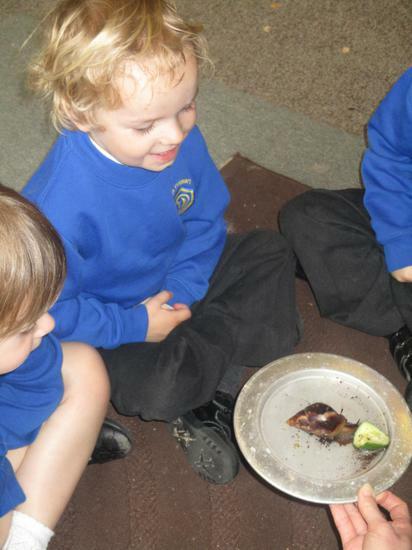 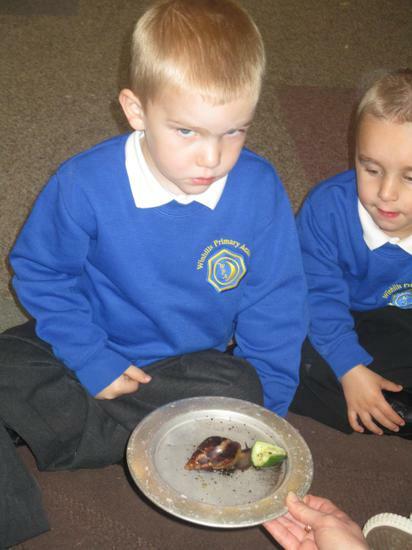 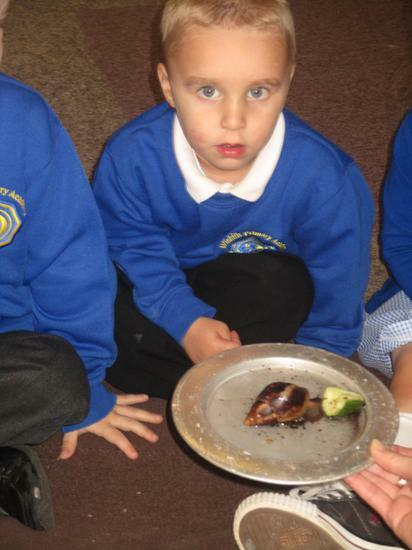 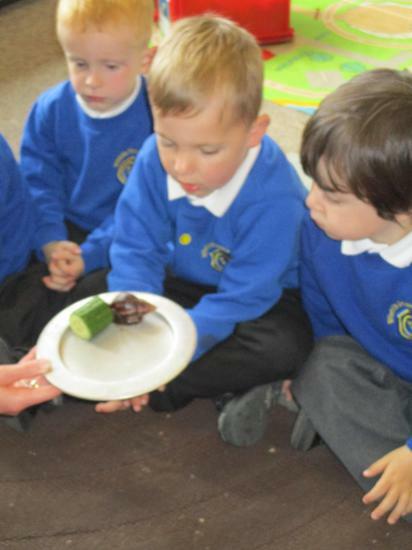 The children have been fascinated with the caterpillars we have in Nursery. 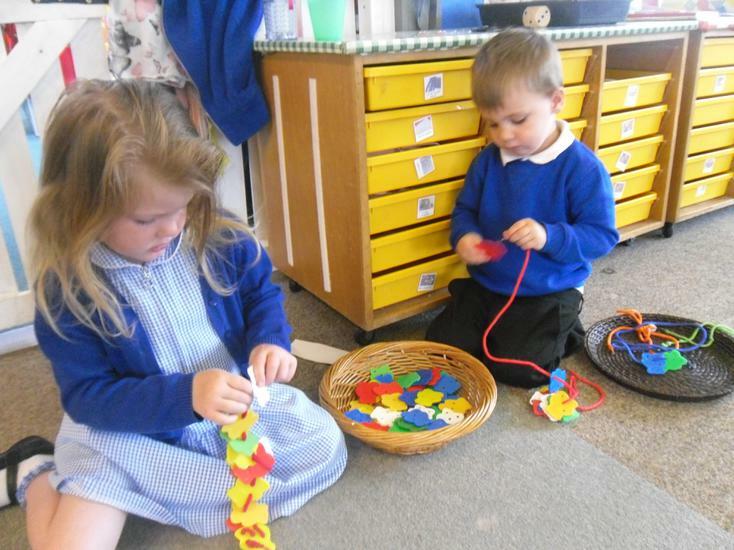 They have been talking about what will happen next as they are getting very big and long. 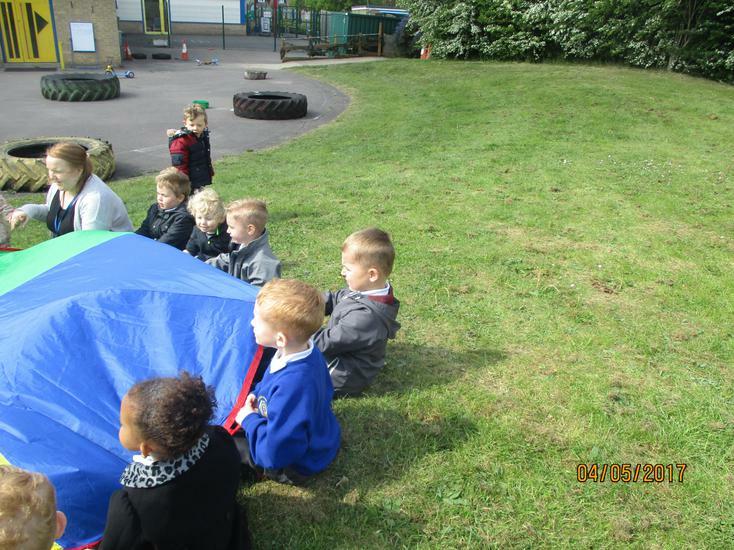 Then over the weekend they have made their cocoons so we have carefully placed them into the butterfly net and are patiently waiting for the Painted Lady Butterflies to appear. 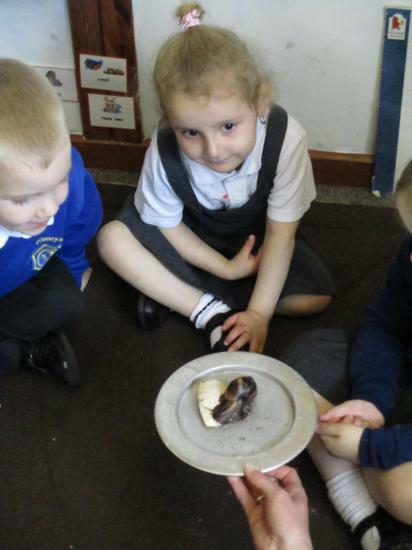 Hooray our butterflies have appeared out of their cocoons! 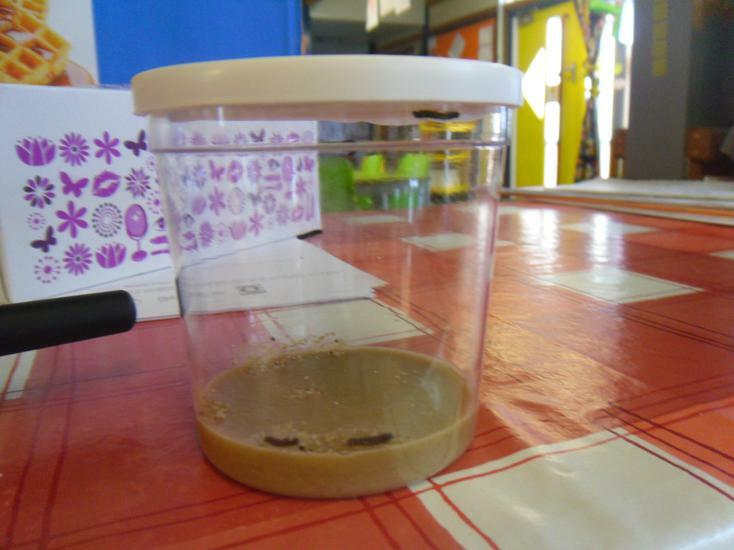 All five caterpillars changed into Painted Lady Butterflies and the children have been fascinated by the changes. 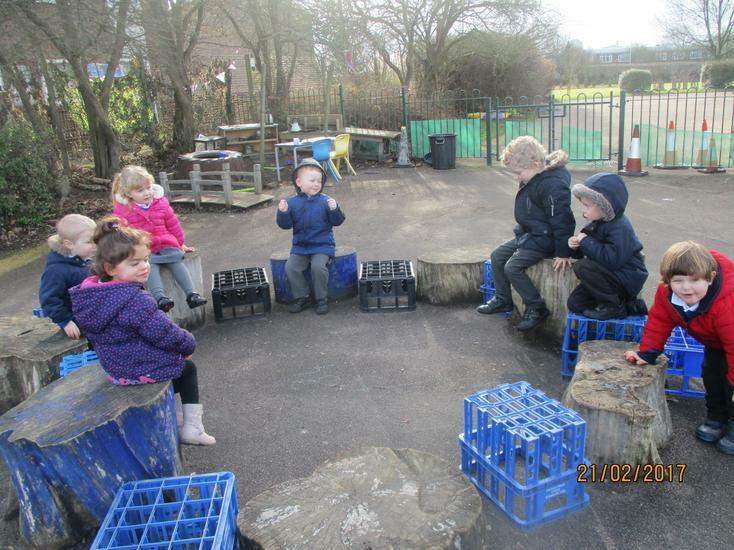 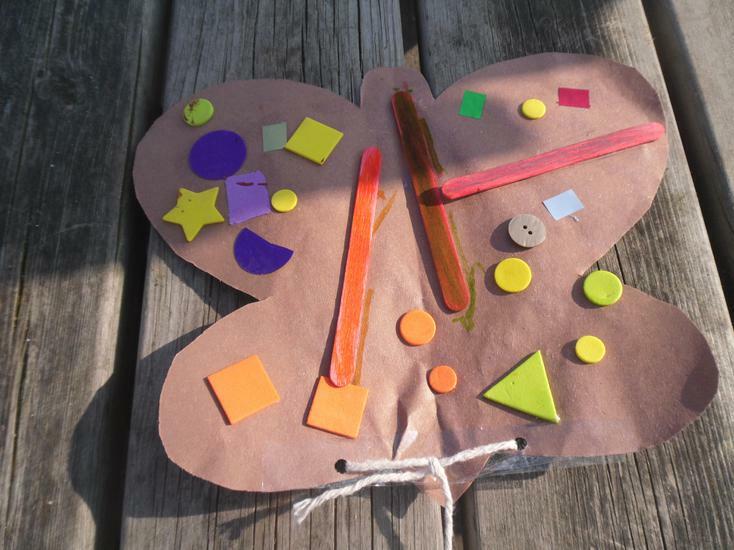 The children sat in a circle on the playground outside and the butterflies were released. 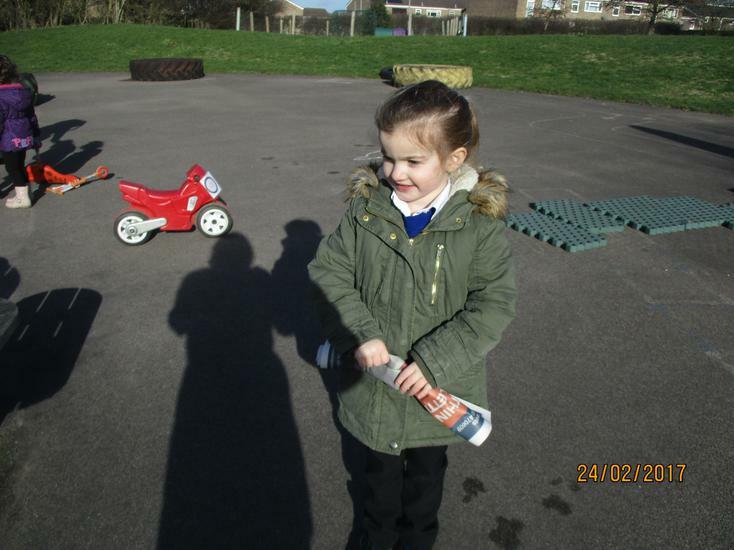 The children have been enjoying the sunshine outside on the playground and on the grass. 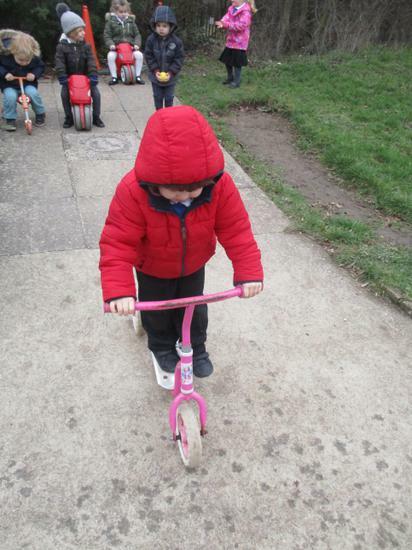 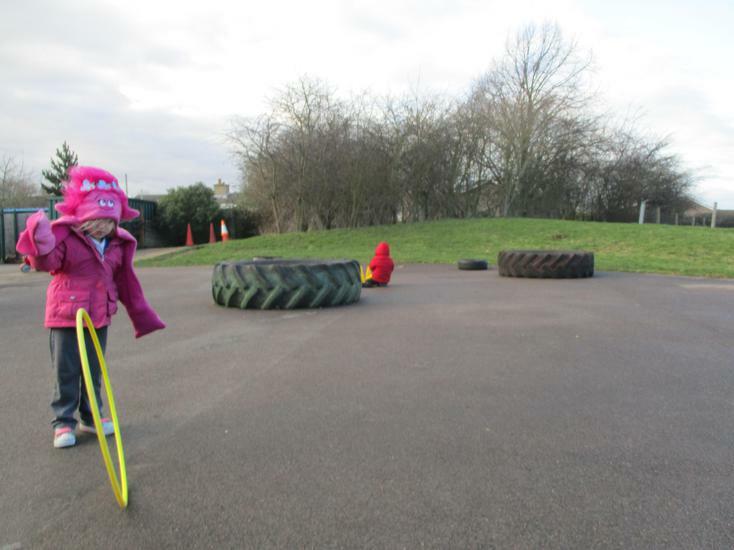 The children are really enjoying riding the balance bikes around the playground and weaving around the cones. 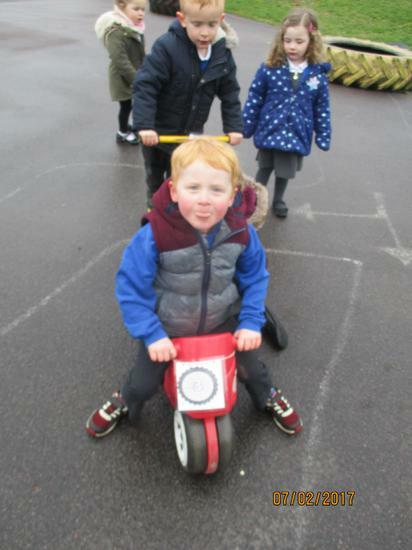 The older children especially are getting very confident at riding them. 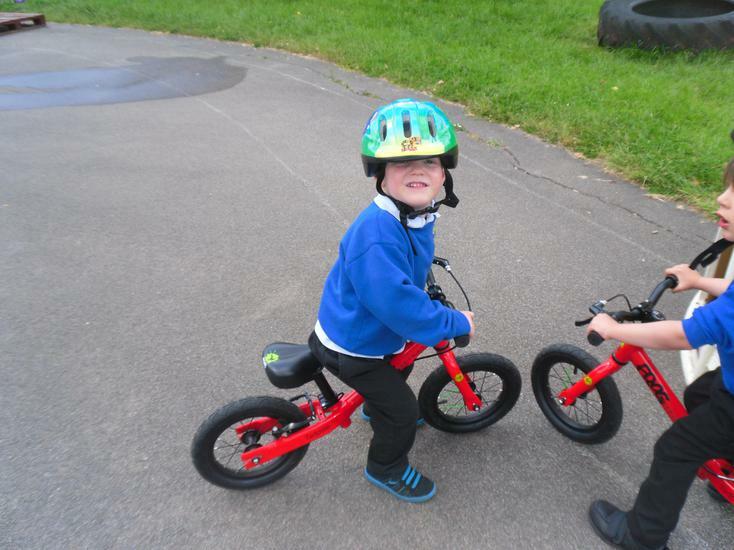 Also the children are very good at remembering to wear a bike helmet. 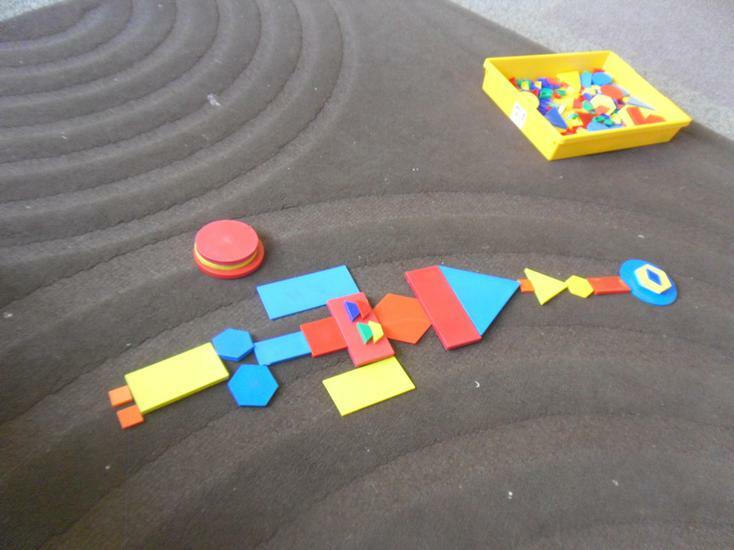 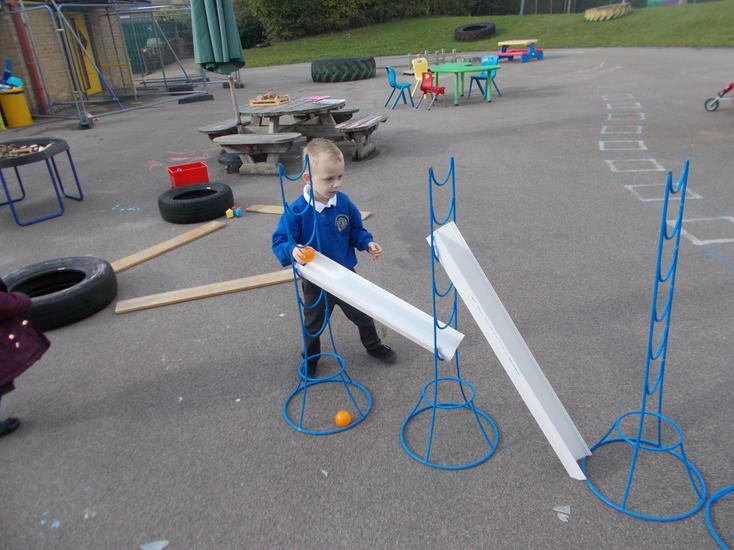 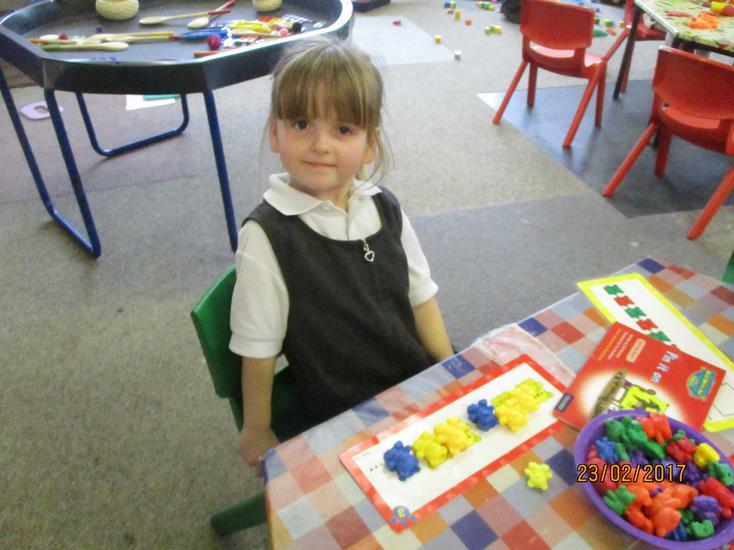 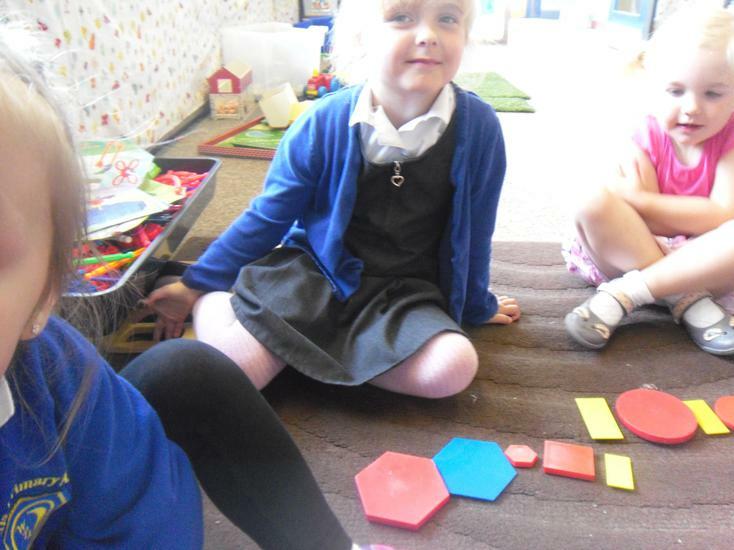 The children have been busy playing and talking about flat 2D shapes. 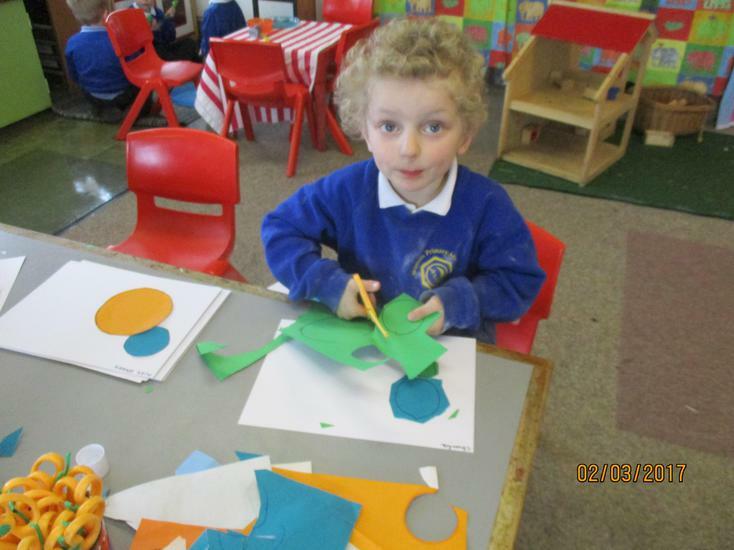 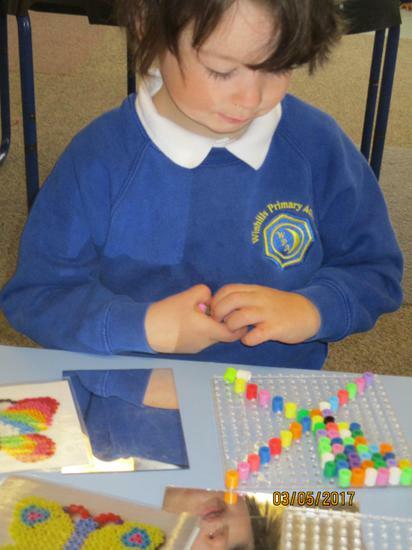 They have been making pictures and patterns thinking about the shapes and colour in these.